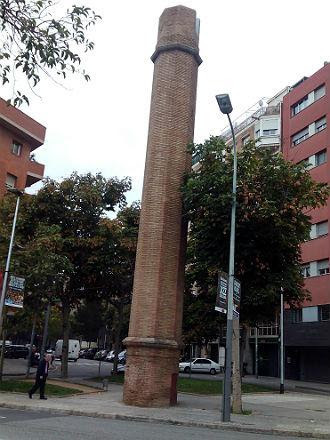 At the corner of street of the Sagrera and the Ciutat de Elx, in Sant Andreu, in Barcelona, an old construction of 14 meters of height survives that seems a small chimney, but it is not it. It is a tower of exposed water that served for the distribution of Rec Comtal water (The Rec Comtal was an irrigation canal near Barcelona, Catalonia, which took water from the Besòs river to the walls of the city). On the other side of Calle de la Sagrera, at number 44, you can still see two stone columns of what was the entrance of the Nemrod factory, founded in 1935 as a toy manufacturer ("Industrias del Caucho y Similares o Sagué Sociedad Anónima", "Sagué S.A." - specialist in surgical, orthopedic and industrial rubber material). 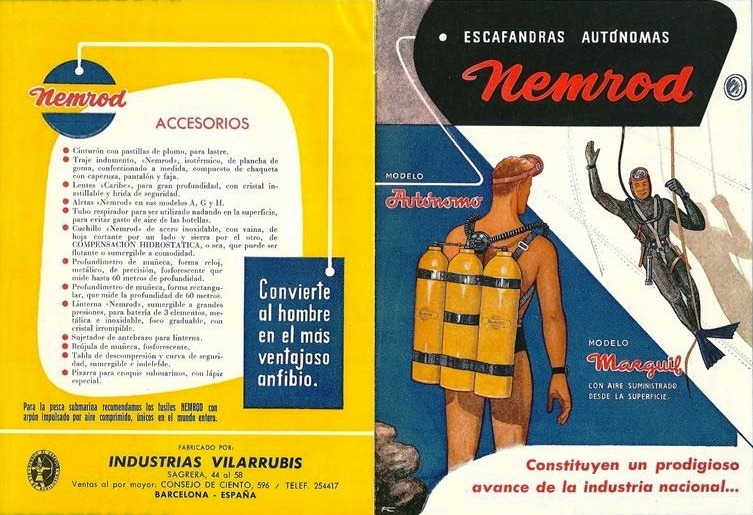 In 1939, the brothers Pedro and Juan Vilarrubís Ferrando, founded an industry of sporting goods, toys and roller skates. 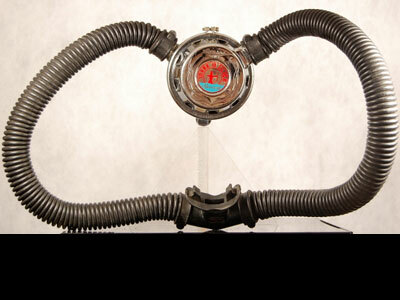 Their affection for the sea is induced to start the manufacture of articles of underwater hunting and immersion. 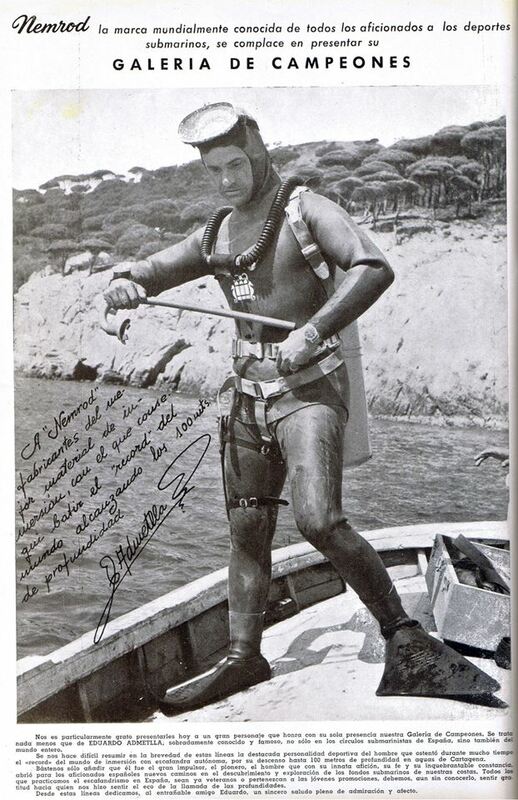 Enrique Dauner tell us that Juan Vilarrubís and Eduardo Admetlla were enthusiasts of the spearfishing sport and at the end of the forties they spent all the free time at the Costa Brava (about 120 km north from Barcelona). During one of his frequent visits to the french city of Perpignan (about 170 km from Barcelona), Juan Vilarrubis bought a revolutionay invention that he has seen at a sports store: an Aqualung. He bought the tank full at 150 bar and a brand new CG45. 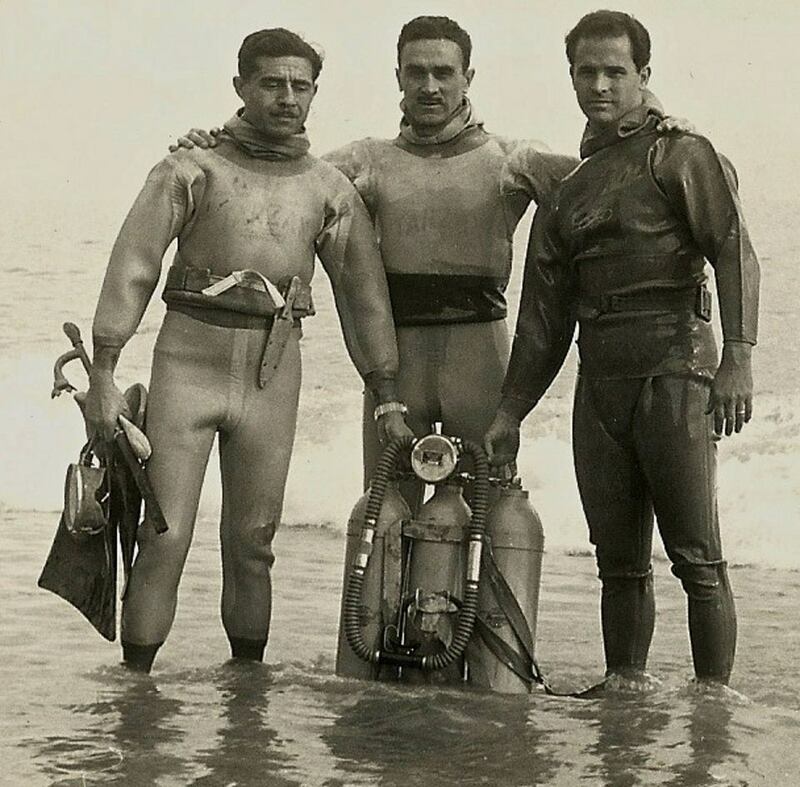 The next weekend, he and Eduardo Admetlla explored the underwater world of Cadaqués with the new invention. 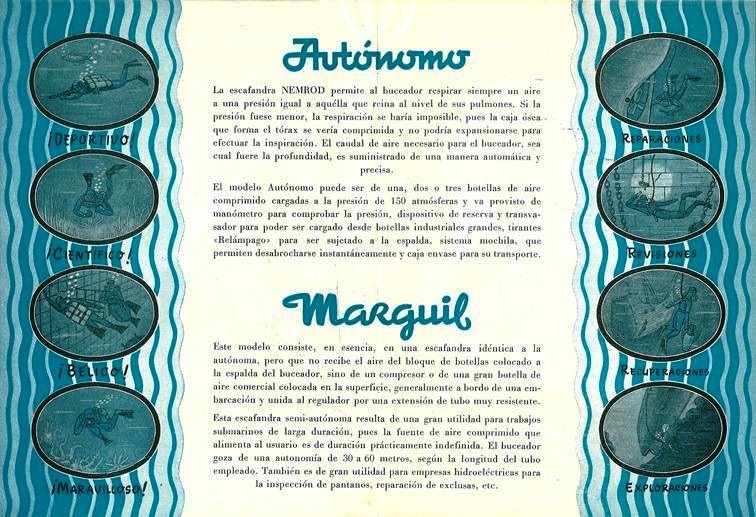 After that experience, Villarubis tried to import the Aqualung in Spain to sale it via Nemrod. 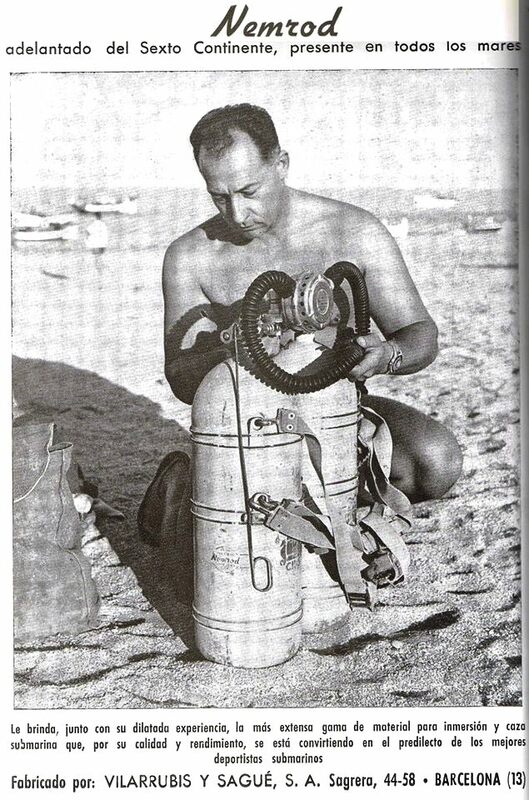 But then he realized that La Spitotechnique had patented the Aqualung (CG45) in France, Germany, USA and other countries, but not in Spain. 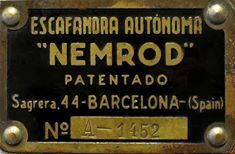 At that time it was very difficult to import foreign material in Spain, and Juan Vilarrubis took the simpliest way: he bought a lot of CG45 in France, introduced them in Spain every weekend as "personal sport equipment", and then changed the label at his workshop of Nemrod in Barcelona (calle Sagrera, 44). 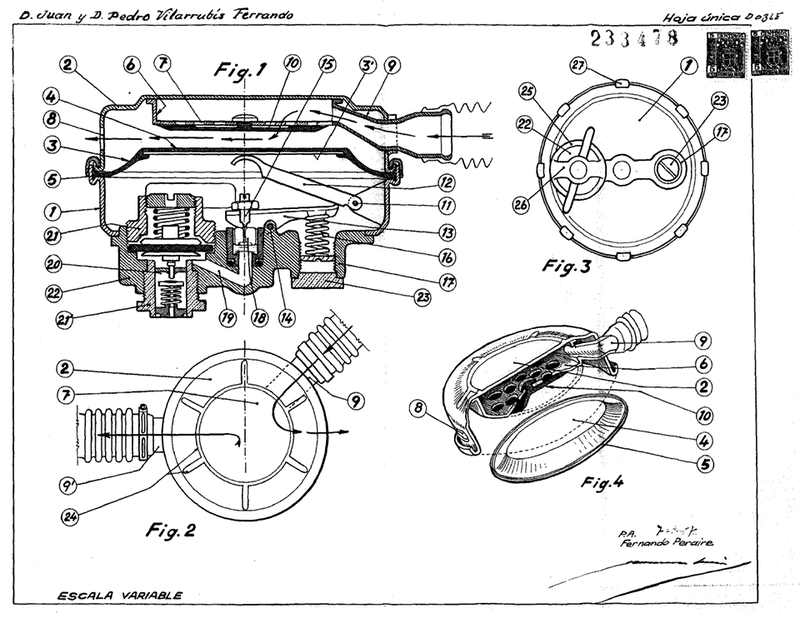 But not only this, he patented the CG45 in Spain! 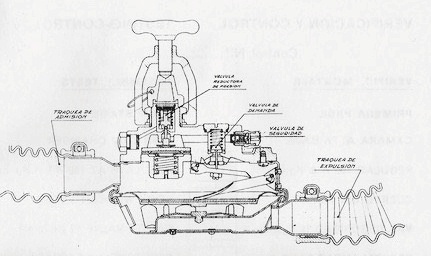 (Years later, La Spirotechnique tried to export regulators to Spain and coulnd't do it beaucuse the CG45 was protected with a "spanish patent"). 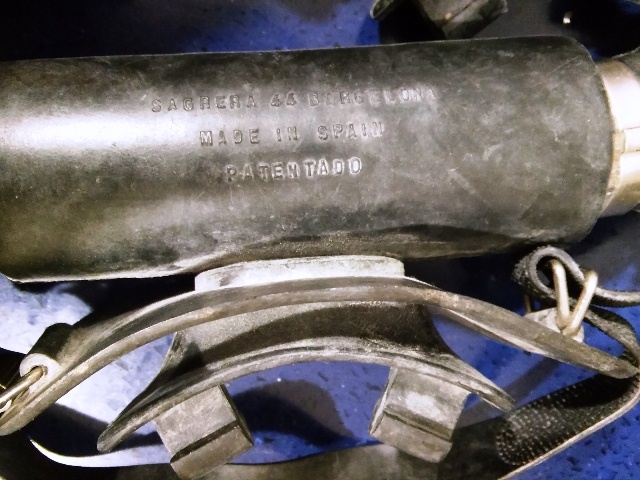 In fact, if you look at the label of the "relabeled CG45", you will see the word "Patentado". 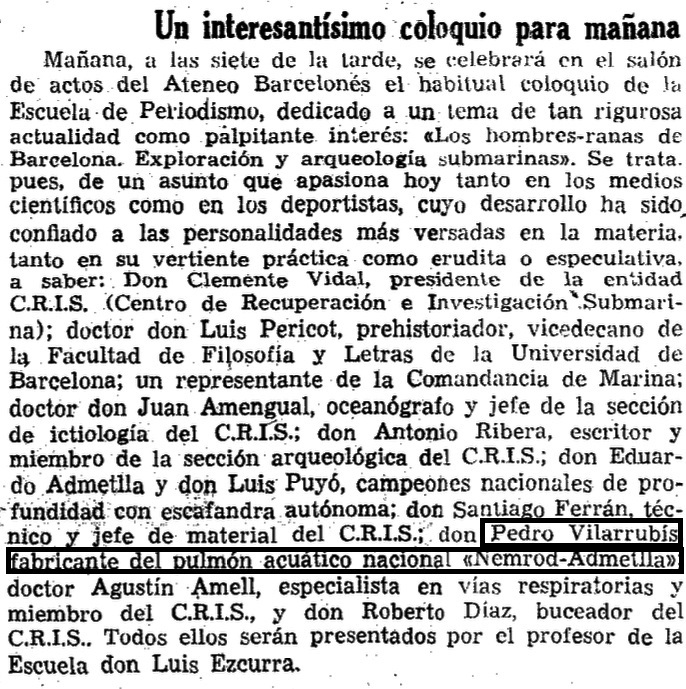 There was never a good friendship between J. Vilarrubís and J.Y. 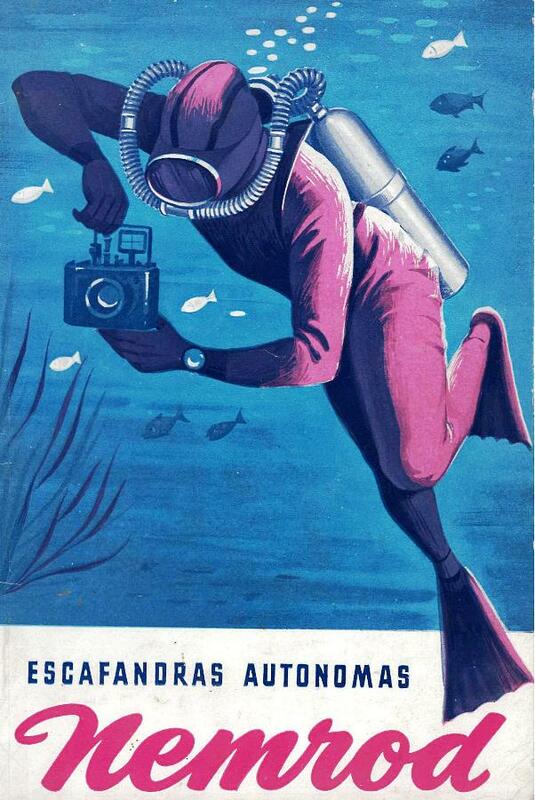 Cousteau . 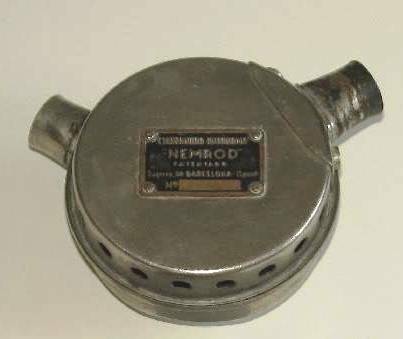 Also, the first "Nemrod" regulators are nothing more than "relabeled" CG45's. 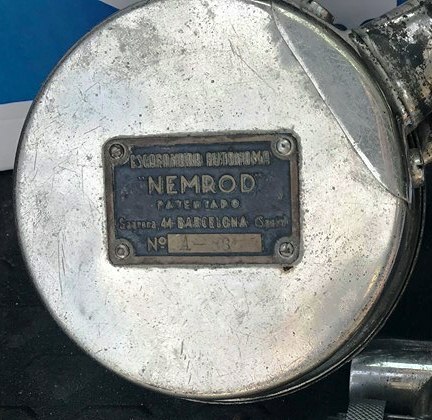 Enrique Dauner tell us that after this peculiar beginning, the Nemrod engineers developed the CG45 to a new regulator made really in Barcelona: the ASTERIA. 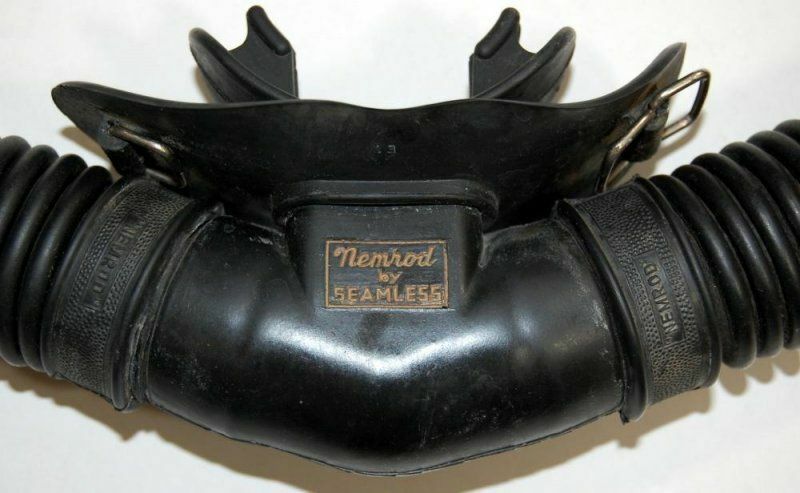 Asteria was the name of a diving mask and a snorkel made also by Nemrod. 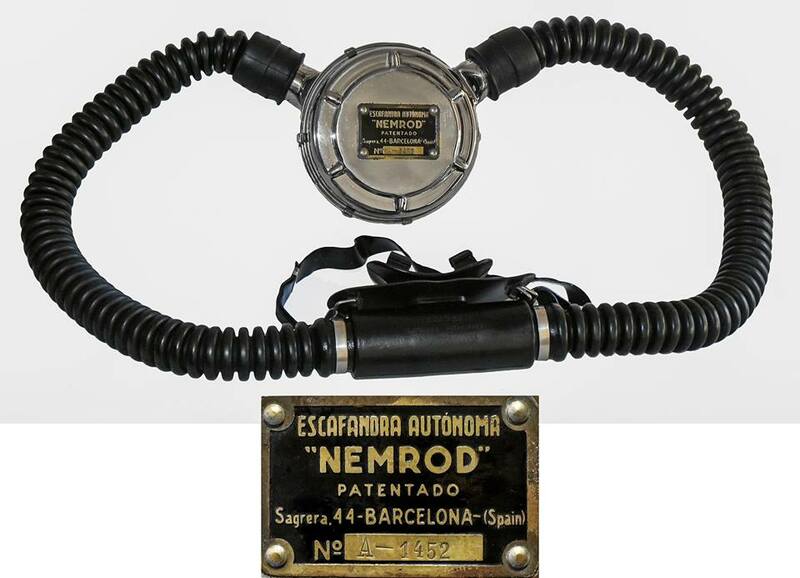 Around 1953, Nemrod introduced bigger improvements in his regulator and created a new model: the V-2. But, why this name? 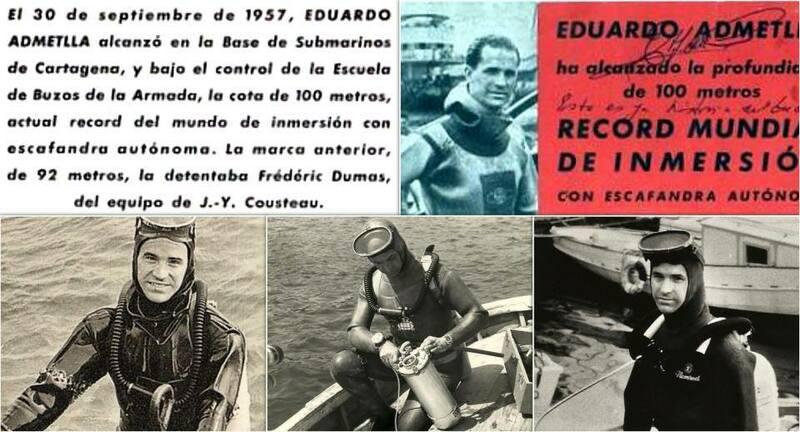 Juan Vilarrubis was not only a good diver but also a pilot that flyed his own Cessna from the "Aeroclub Barcelona-Sabadell". As pilot, he admired also the german aeronautical developments of WWII and specially the last rockets designed by Werner von Braun to destroy England: V-2. Years later, Werner von Braun designed also the Saturn V that put the first men on the Moon. 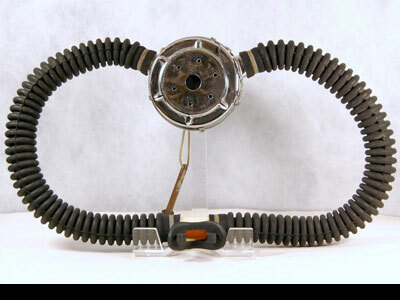 And Nemrod introduced his best single hose regulator: Saturn V.
At the same time as the V-2, Nemrod developed his first single hose regulator (very similar to the Aquamatic from Spiro). 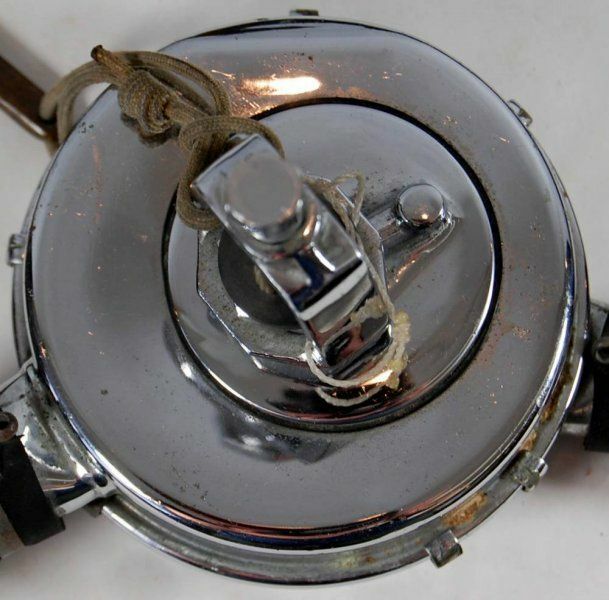 This new regulator came to the spanish market at the end of 1959 with the name of "Asteria II", but soon changed it for "Snark II" beaucuse the name Asteria had some problems for exportation and "Snark" was not registred in the international market. 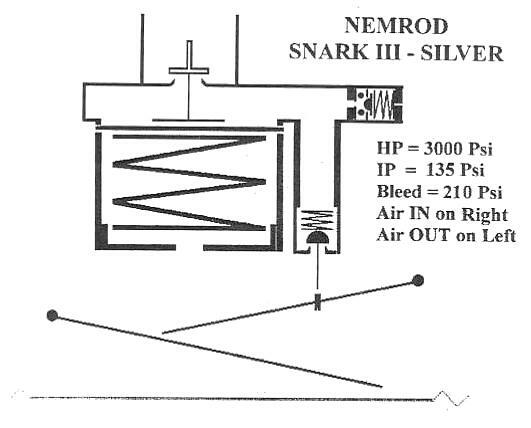 Enrique Dauner concludes: "Now I hope that you understand why the first popular Nemrod double hose has the name of "Snark III" and the first singlehose was the "Snark II". 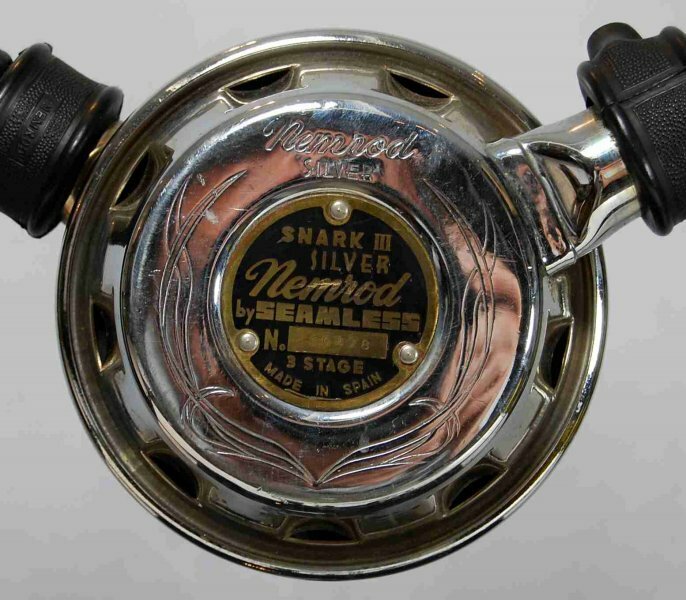 The "Snark I" never existed." 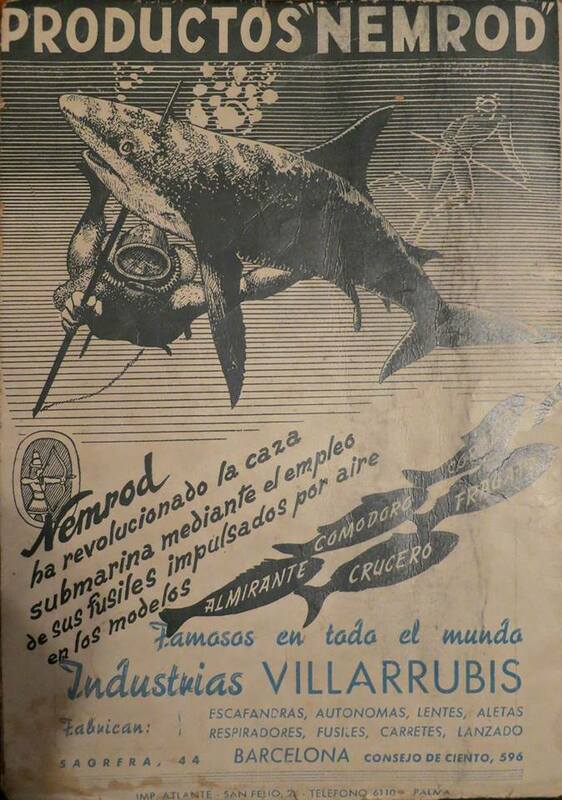 In 1941, when the brothers Vilarubis joined the firm Nemrod, the manufacture of masks, fins and spearguns began. 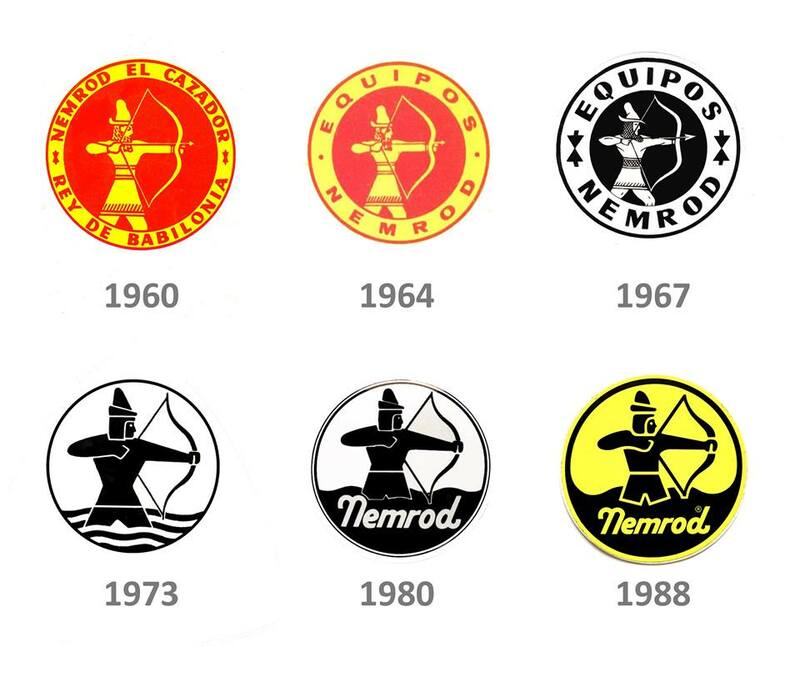 And four years later, in 1945, the brand "NEMROD" (named after the popular king Nemrod de Caldea, who stood out for his hunting skills) is registered. In this year the first swimming fins appear. This primary material is immediately followed by the introduction of regulators, and various elements that complete the diving activity.. 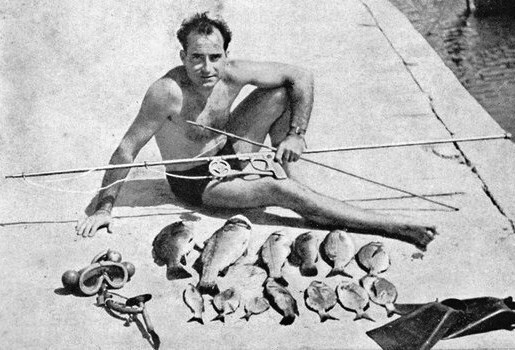 In 1949, regulators began to be sold in the United States and the patent problems began with Cousteau (who lost the legal battle of the patent). 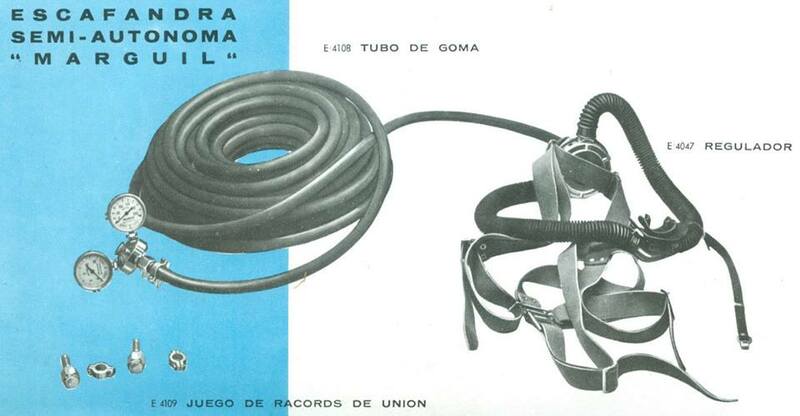 In 1959 the company Seamless Rubber, from Connecticut, began manufacturing in the United States under license ("by Seamless"), where the "Made in Spain" label for rubber manufacturers was synonymous with high quality. 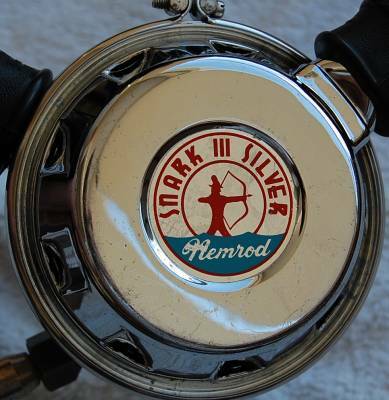 The Decal Logo portraying an Archer Drawing his bow with the Trademark Nemrod above and Distributor Seamless below was placed on both Tanks and Backpacks. 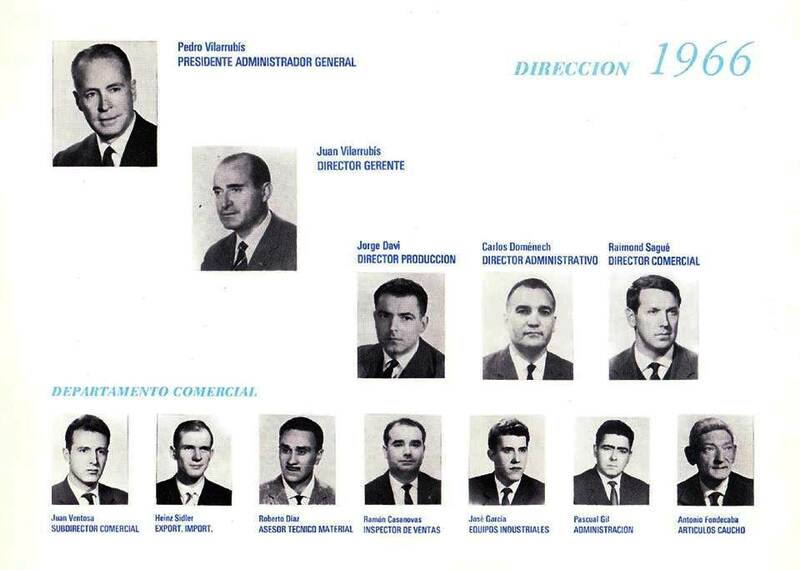 In 1953, the merger between the Vilarrubis and Sagué families took place, creating the firm VILARRUBIS Y SAGUE .S.A. 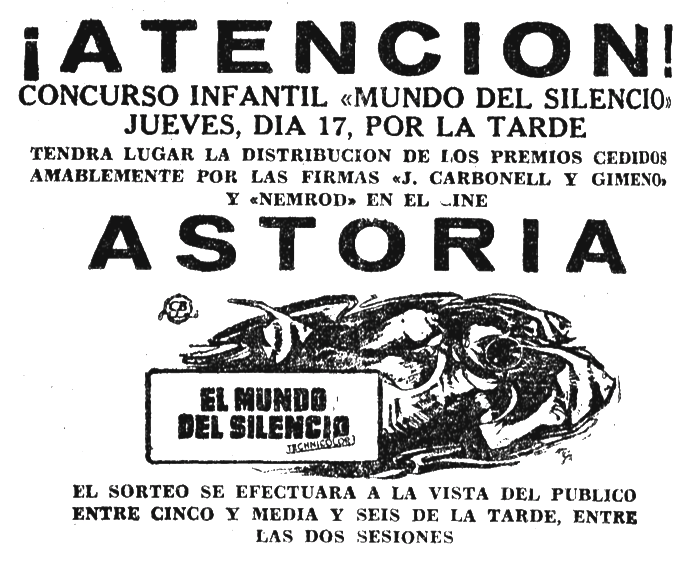 (Industrias Vilarrubis) and the line of products with masks, respirators and rifles increases. 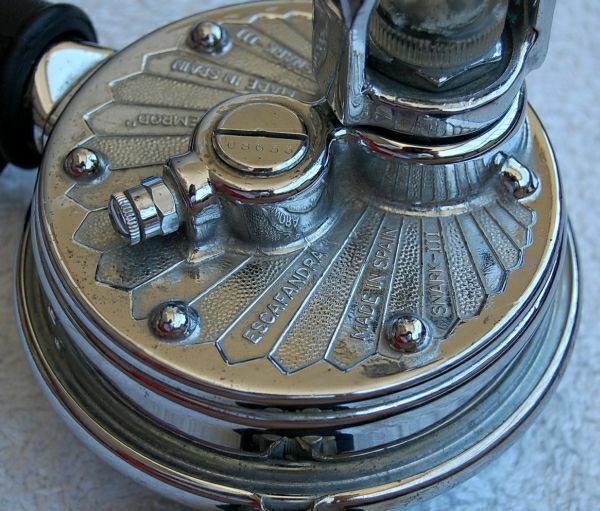 In 1966 a new merger took place, this time with "METZELER KAUTSCHUK". S. A. of Germany (whose mother company since 1974 is "BAYER") that had 50% of the capital. The range of production with pneumatic boats was extended. 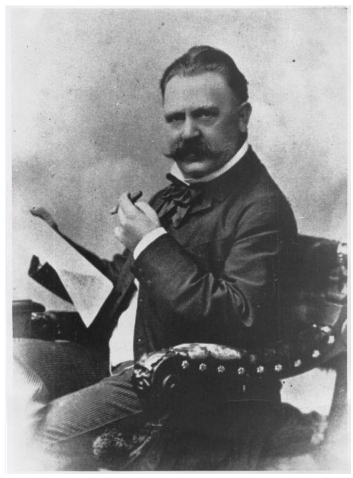 1863 - Robert Friedrich Metzeler opened a commercial firm selling rubber and elastic goods in Munich, Germany. 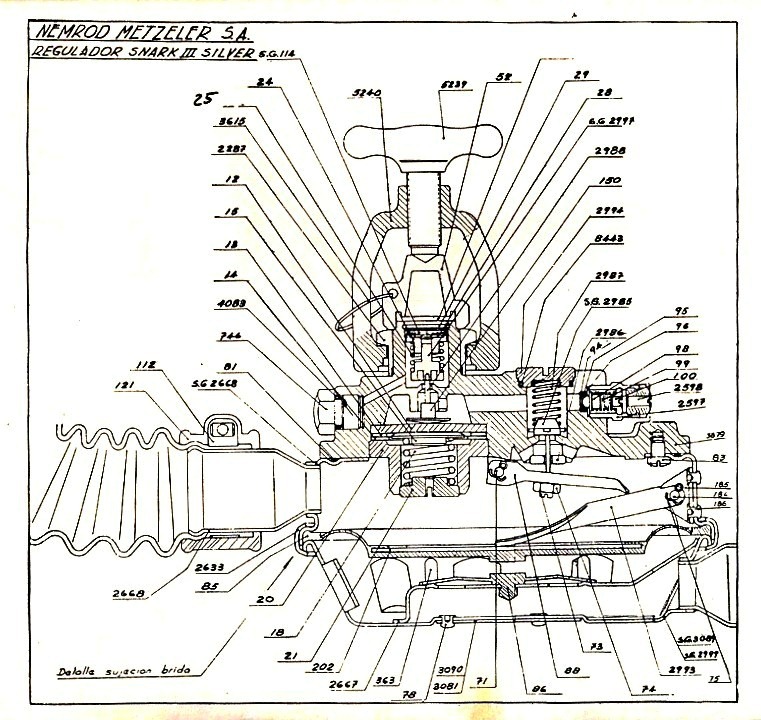 Some of Metzeler's early products included technical and surgical articles, sports equipment, toys and weatherproof clothing. 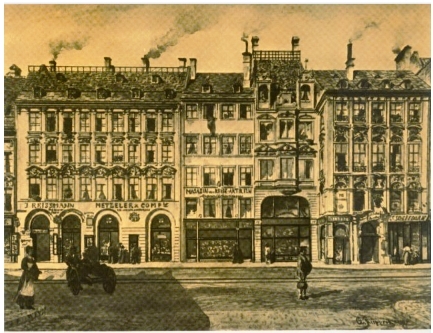 1871 - Metzeler established their first factory for rubber products in Schwanthalerstrasse. By 1887 the factory's capacity was unable to satisfy demand, so a new factory was built. Thanks to new procedures the India rubber processing was revolutionized, it then was granted the patent for this process. 1890 - Metzeler became leaders in the growing aviation industry, developing a multilevel rubber manufacturing method for linen and cotton fabric. 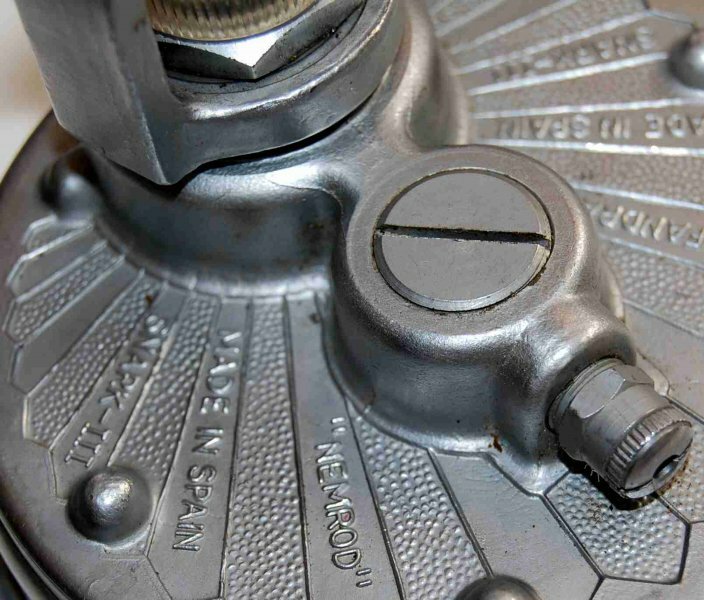 This product was used for balloon, airship and aircraft construction. 1892 - Metzeler played an important role in tyre development for the bicycle, motorcycle and motor-car industry. 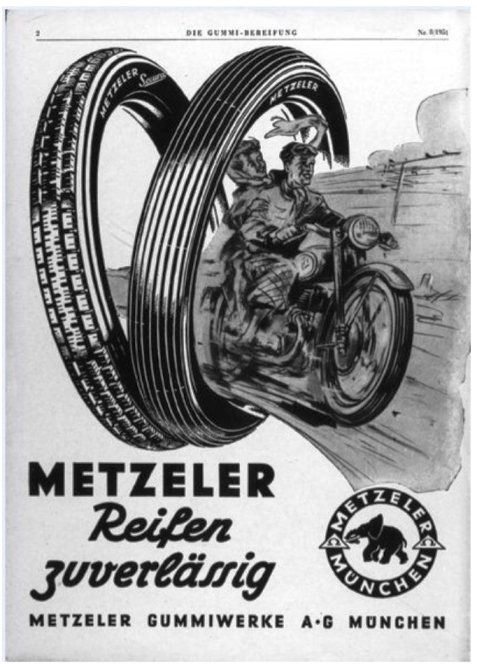 1933 - Metzeler set an impressive achievement in tyre manufacturing by making the first useful tyre using the new synthetic rubber 'buna'. 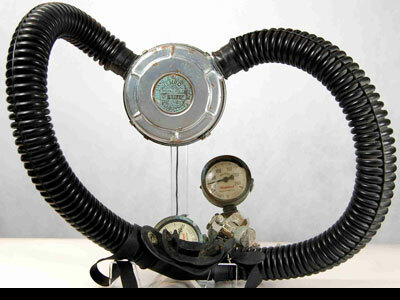 1937 - Set the high-speed world record for motorcycles at 279.5 km/h. 1945 - The factory was completely destroyed during the war. 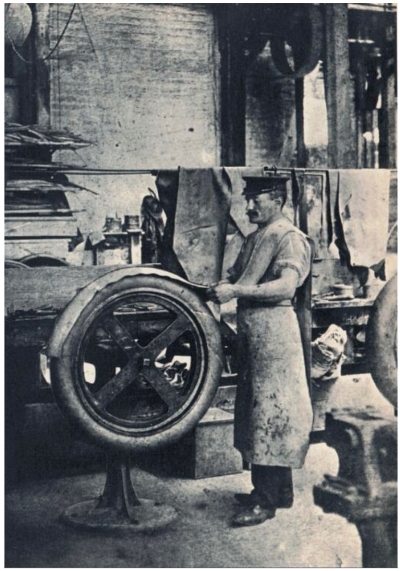 Reconstruction began immediately and in the following years, apart from traditional tyre manufacturing, other activities were developed in the technical rubber segment and for the leisure market. With the aim of strengthening its business in Spain, the Munich plastics and rubber company METZELER AG has linked with Spanish interests to form a joint venture MIRET-METZELLER SpA, Villafranca del Panades, Barcelona, which will manufacture plastic packaging materials. 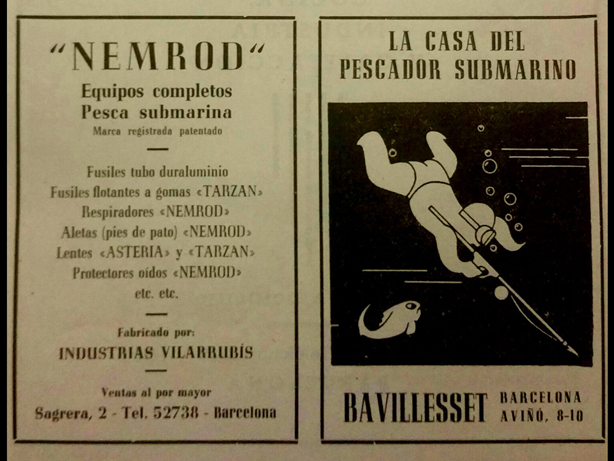 This move closely follows the takeover of the Barcelona producer of rubber goods for sport and diving equipment Nemrod, in the company Nemrod-Metzeler SA. 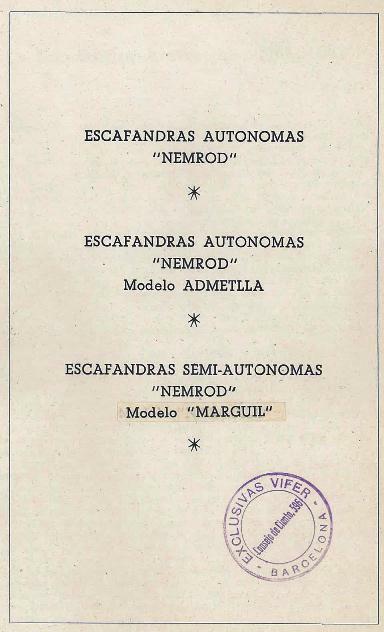 In 1963, Nemrod took part - through Villarubis & Sague, Barcelona - in the formation of the Paris sales company Nemrod-France Sari (capital Ff 10,000) along with French interests represented by MM. Germain Bonneau, Perpignan and Richard Plosa, Paris (45% each). 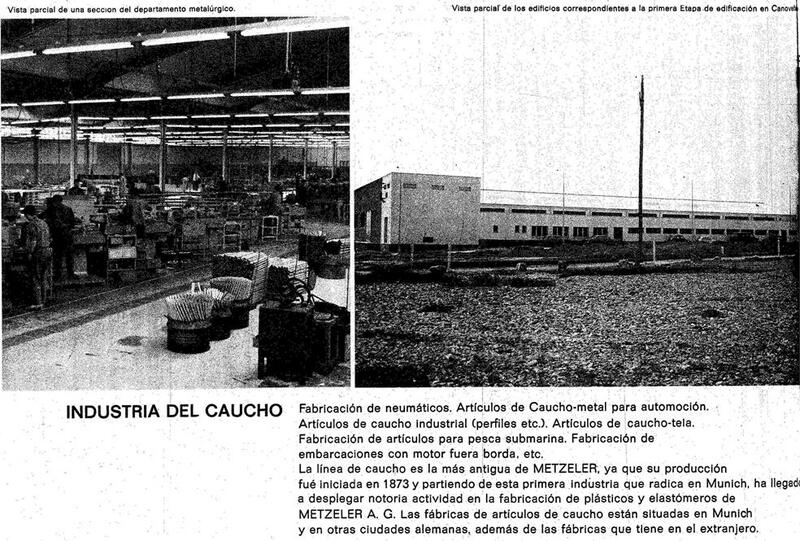 In May 1964, Metzeler formed another Barcelona subsidiary Metzeler Industria Espanola Del Polieter SA in conjunction with INESPO-Industria Espanola Del Polieter SA. This venture manufactures polyurethane foam for use in the automobile, furniture and textile industries. 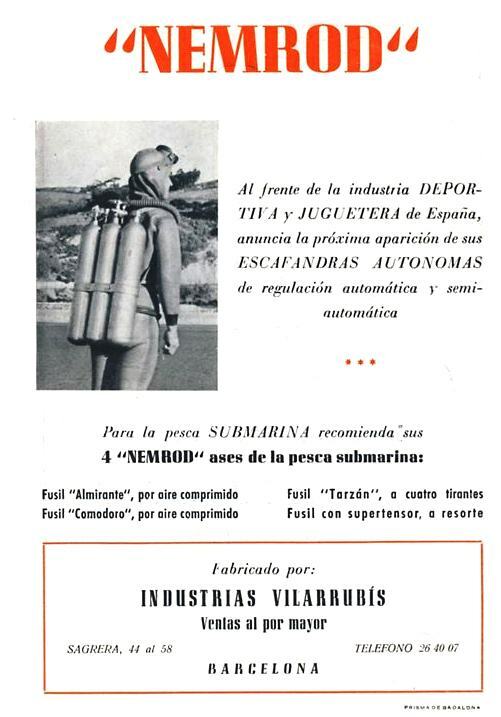 The brothers Vilarrubis, set up in Barcelona the first industry dedicated to manufacture in serie of equipment for underwater hunting and diving. 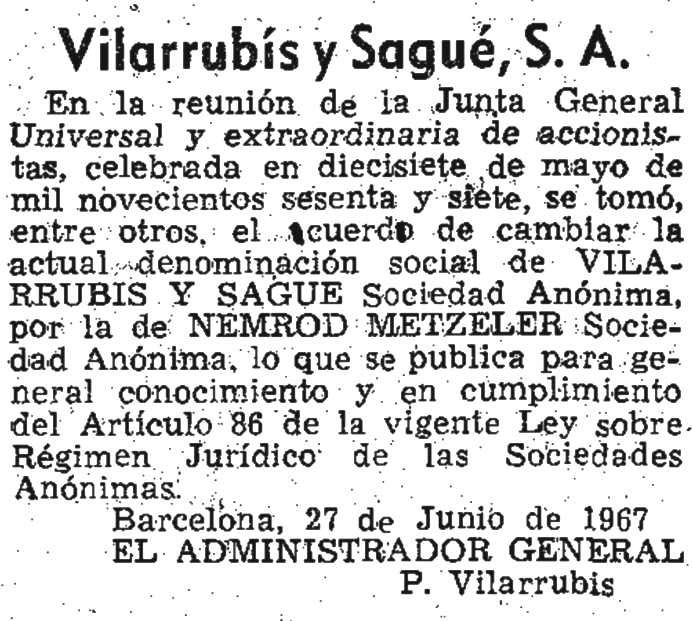 In May 17, 1967, VILARRUBIS Y SAGUE Sociedad Anónima, changed the corporate name to NEMROD METZELER Society Anonymous, what was published in June 27, 1967 (Barcelona) for general knowledge and - in compliance compliance of Article 86 of the current Law on Legal Regime of the Societies Anonymous. 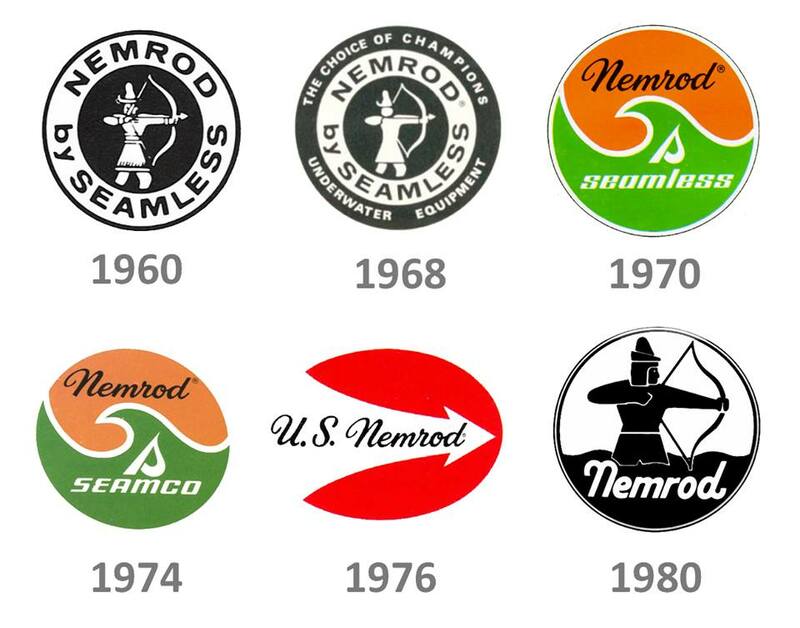 The new industry named Nemrod Metzeler, S. A, was associated with GETEFO, of H6hr-Grenzhausen, of West Germany, wholly subsidiary of the Company METZELER AG, from the same country, sold its products on all five continents through 65 countries. 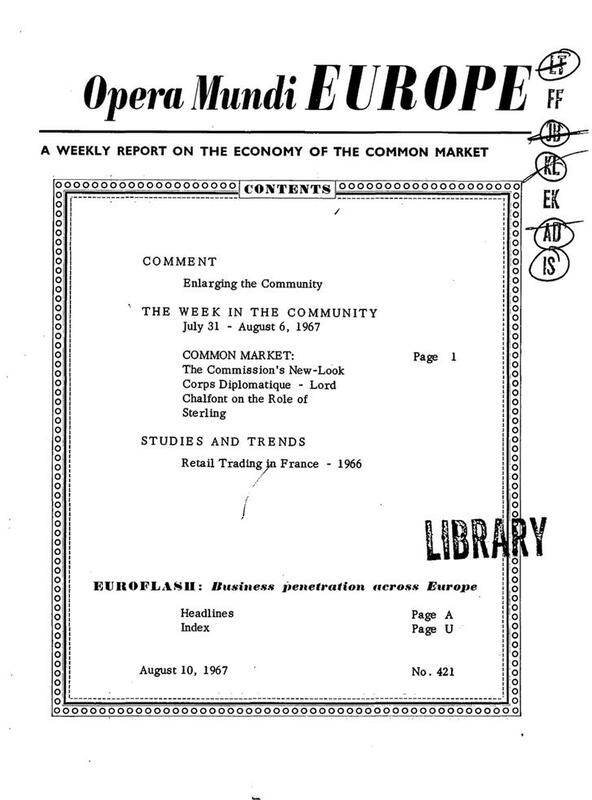 The activity as an Export Entity was recognized by the Government of Spain - Ministerial Order in February 29, 1968. 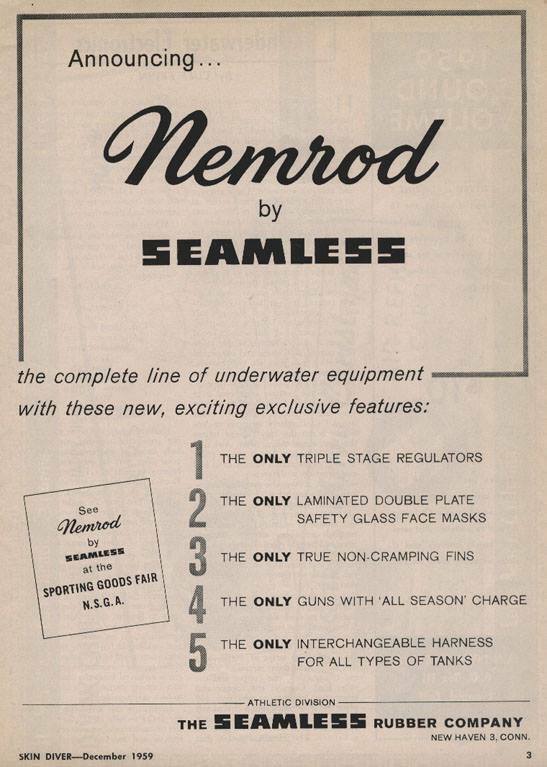 As a complement to the underwater material, Nemrod manufactures inflatable boats for sporting uses recreational, industrial, salvage and military. 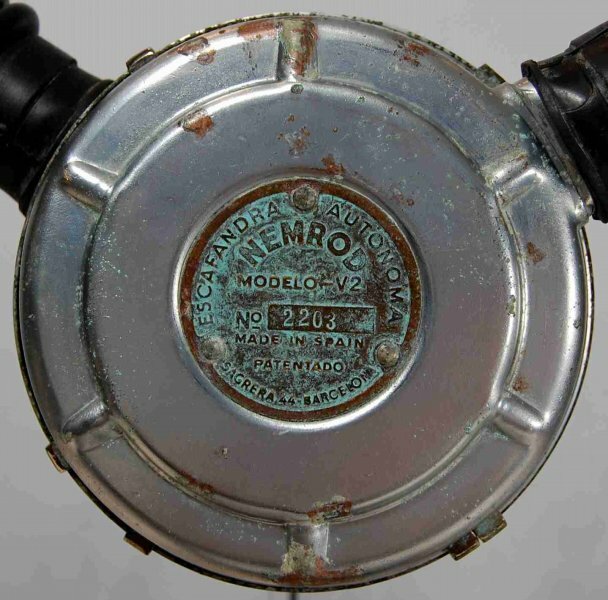 Nemrod Metzeler, S. A., also developed other activities, such as the manufacture of rubbers parts and profiles for the industry in general, as well as the construction of safety devices and protection at work that distributed through its co-subsidiary MSA Española, S.A., co-subsidiary of MSA, of Pittsburgh (USA). Its old factory located on Sagrera Street, in Barcelona, has moved to the neighboring town of Canovelles where had land of an area of ​​27,000 m2. 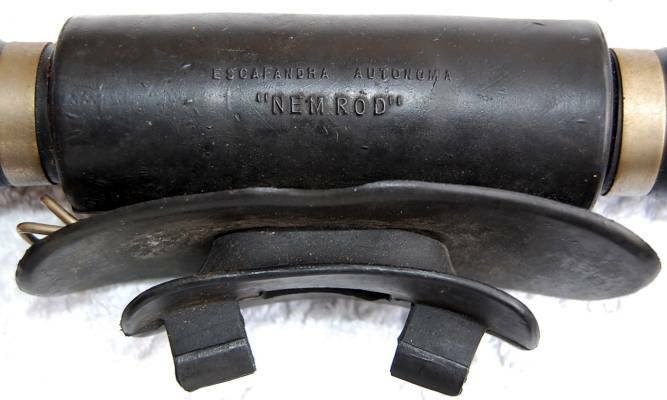 The German Metzeler (technical rubber and polyurethanes), which had been a shareholder of Nemrod almost from the beginning, increased its shareholding until it reached 100% in 1981. At the end of the 1980s, they moved the factory to the United States. Metzeler also has acquired Barakuda in Germany. 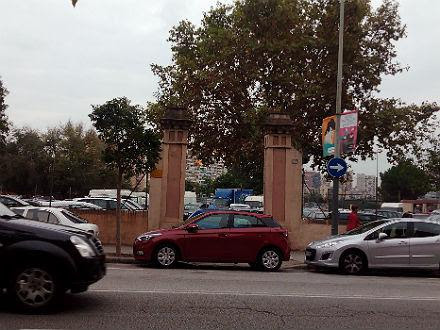 From the company Nemrod, there are only the two stone columns of the entrance that now access the Circuit Municipal d'Automodelisme Rec-Comtal. 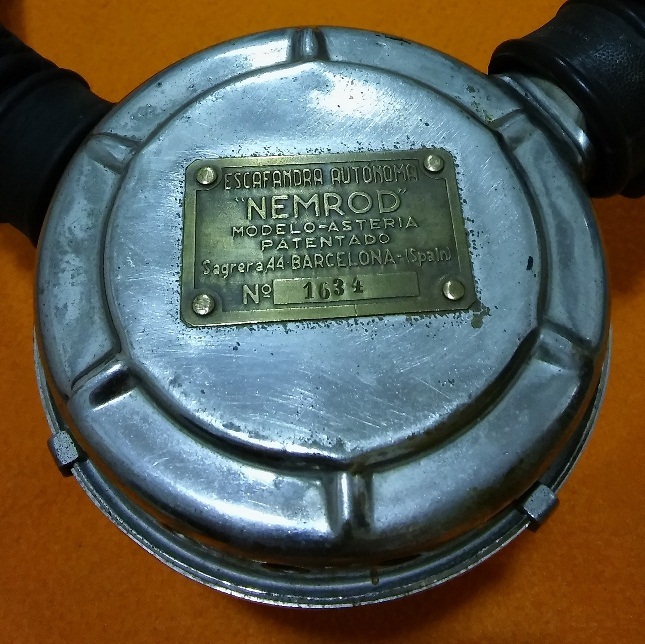 This is the Nemrod CG-45 produced in 1953-1954. 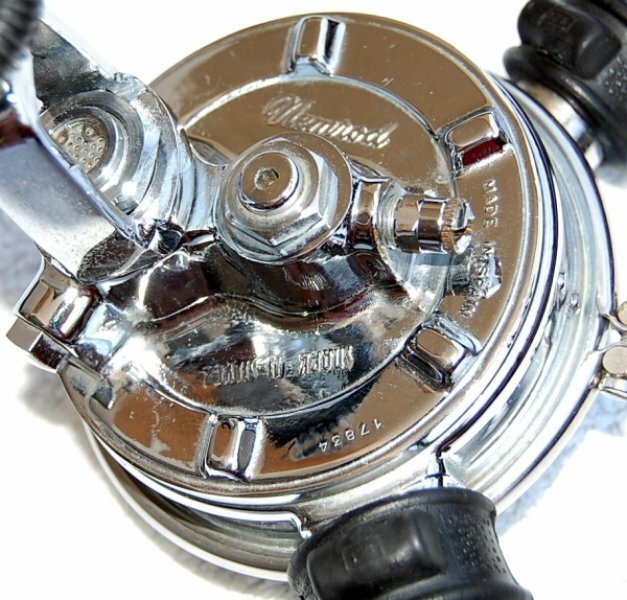 The double hose regulator Nemrod is a copy of CG-45 from La Spirotechnique. 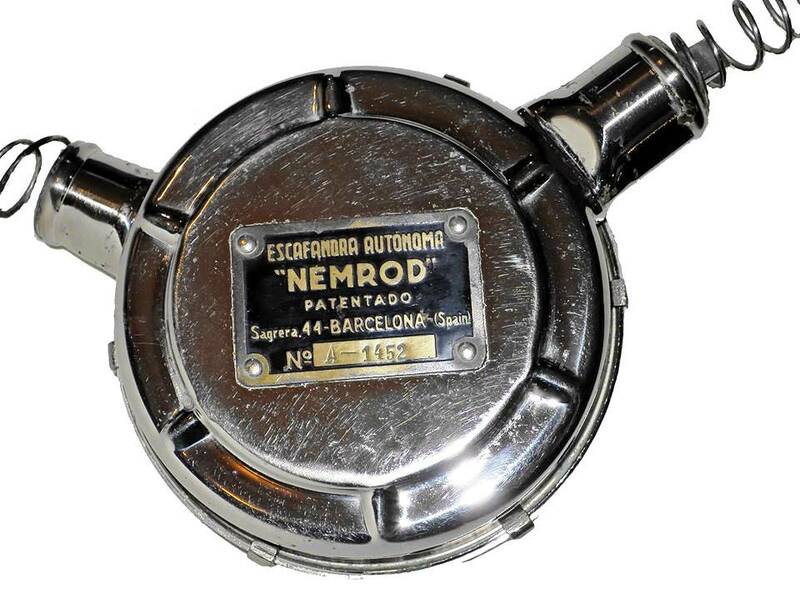 - Escafandra Autonoma Nemrod - The Escafandra Autonoma Nemrod was offered with one cylinder, two cylinders or three cylindres, pressure gauge, reserve device system, device to fill the cylinder directly from large bottles, wooden box for container and transportation. 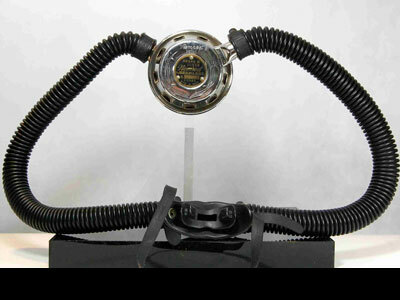 - Escafandra Autonoma Nemrod MODELO ADMETLLA - In this model the air is regulated by the pressure exerted on the cheeks of the mouthpiece by the diver's teeth. The more pressure, the more air flow supplied. 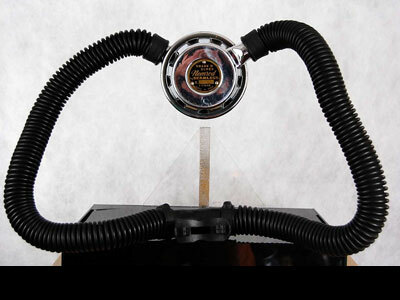 In this model, it has been dispensed the automatic regulator with rubber membrane. 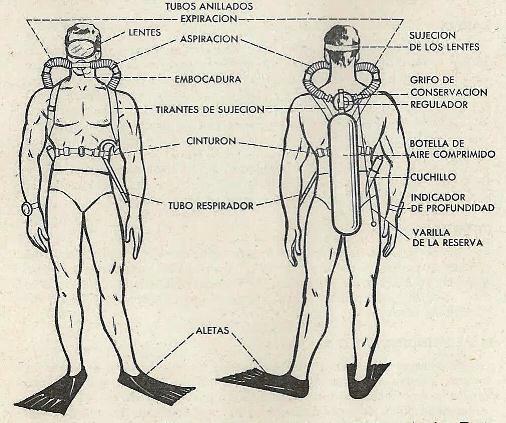 It is the diver himself who defines his air needs. 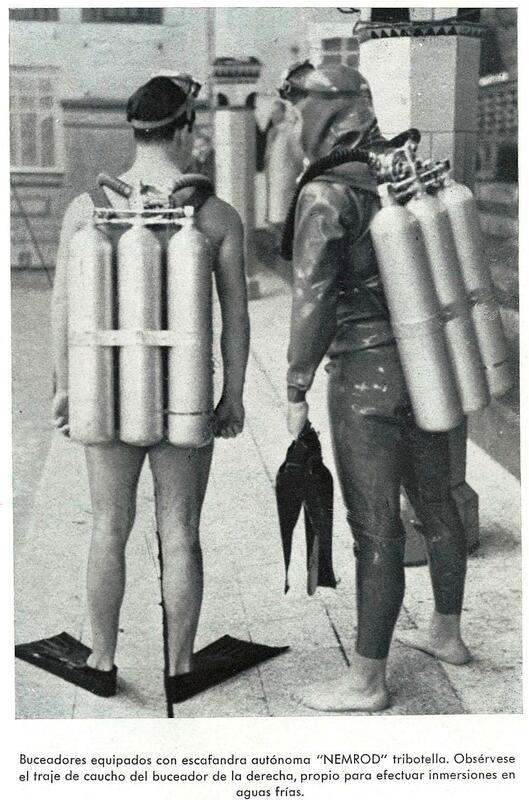 Acquired certain practice, the diver got a perfect breathing rhythm. 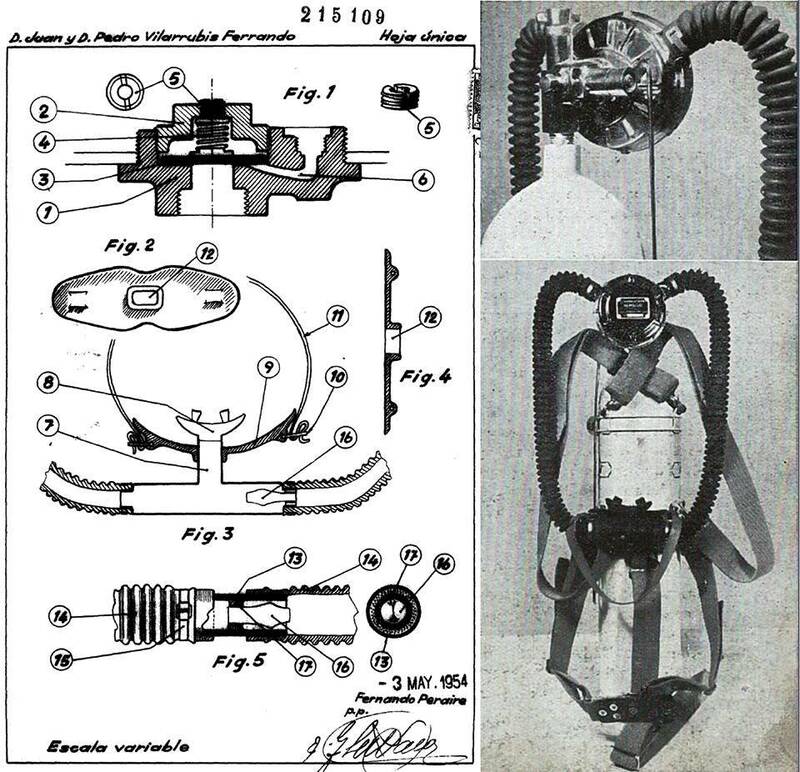 As well as remaining details of the model Nemrod, the Admetlla model was highly recommended for underwater caving and other exploration work. 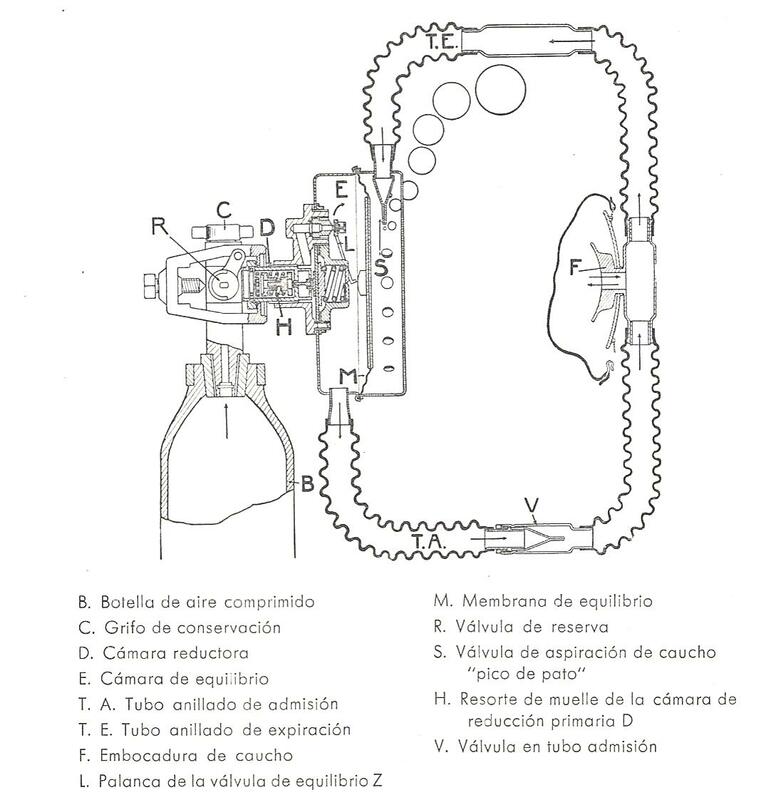 - Escafandra Semi-Autonoma Nemrod MODELO MARGUIL - The semi-autonomous model MARGUIL (name taken from the famous Turkish pipe, with which it has a certain analogy) essentially consists of a regulator identical to the one used in the Escafandra Autonoma Nemrod, but which does not receive the air from the cylinders placed on the back of the diver, but a compressor or a large commercial air bottle placed on the surface, usually aboard a boat, and attached to the regulator by a very resistant tube extension. 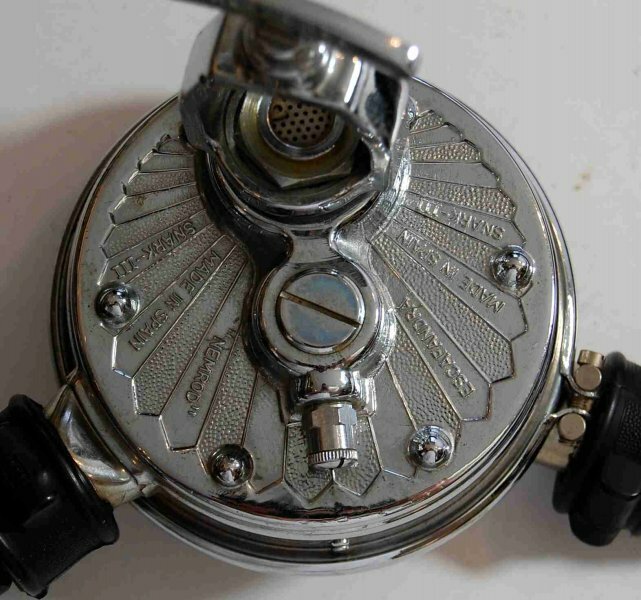 This is one of the oldest regulators manufactured by Nemrod. 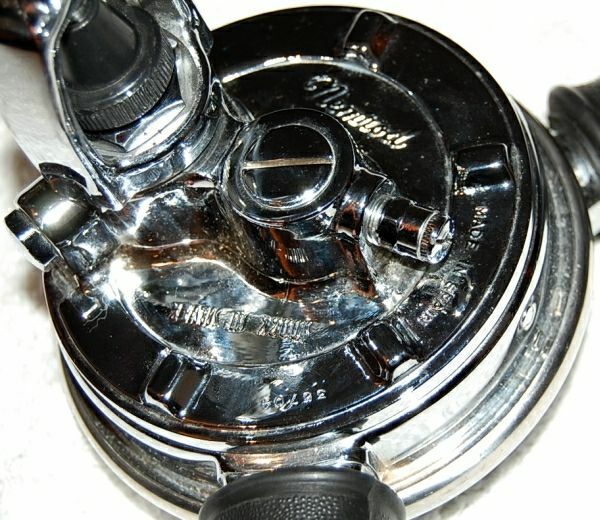 It is an intermediate model between the Nemrod CG-45 model from 1953 and the Asteria model that was manufactured later. 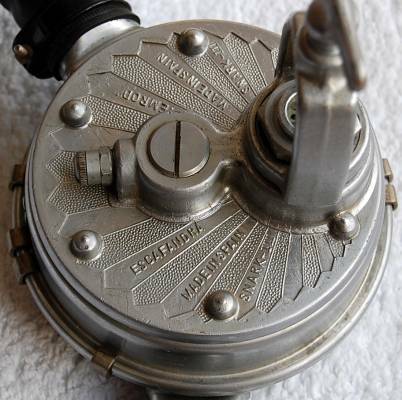 CG-45 Collection owns a double hose regulator in its collection that is, probably, a prototype of the Asteria. It is a a blend of characteristics of the Nemrod CG-45 and the Asteria. 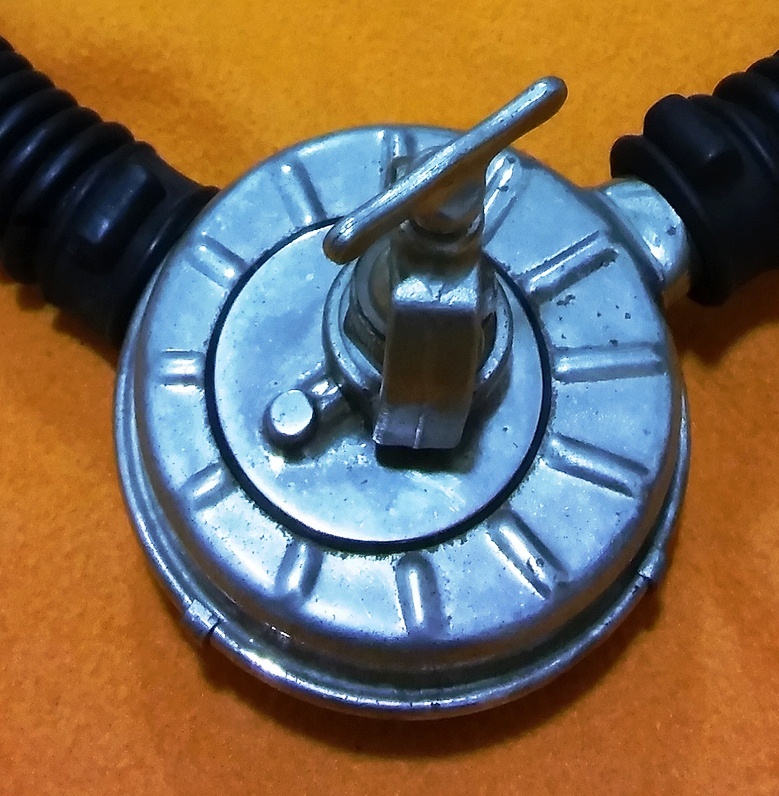 Bellow, It is one of the rarest variants of the Nemrod double hose regulators, since it was only a few months in the market before being replaced by the Asteria. 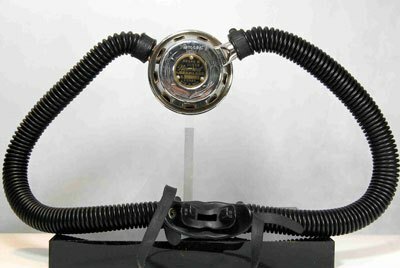 This regulator is one of the jewels of the Nemrod Museum collection (https://www.facebook.com/nemrodmuseum/). 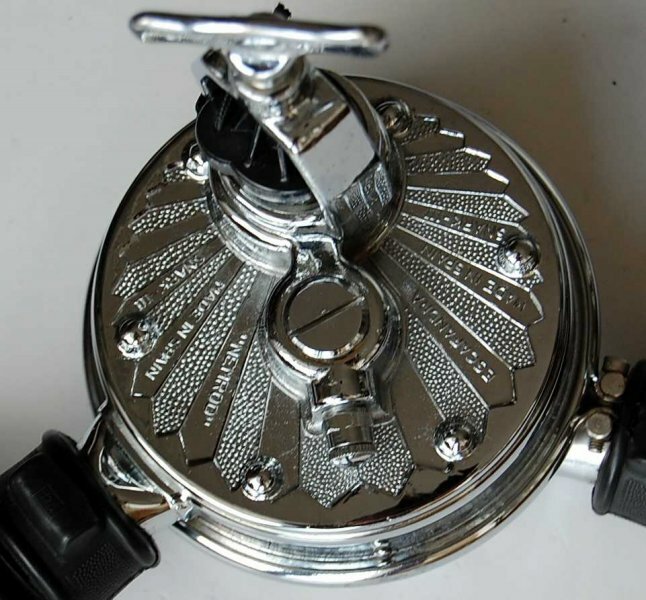 Most features are already in Asteria model but retains details of the previous model, such as the identification plate and the connection cylinder screw. 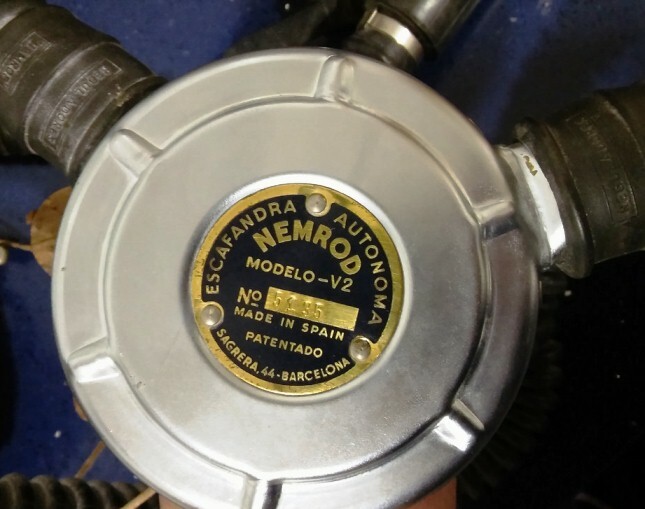 The Nemrod engineers developed a new regulator made really in Barcelona: the ASTERIA. 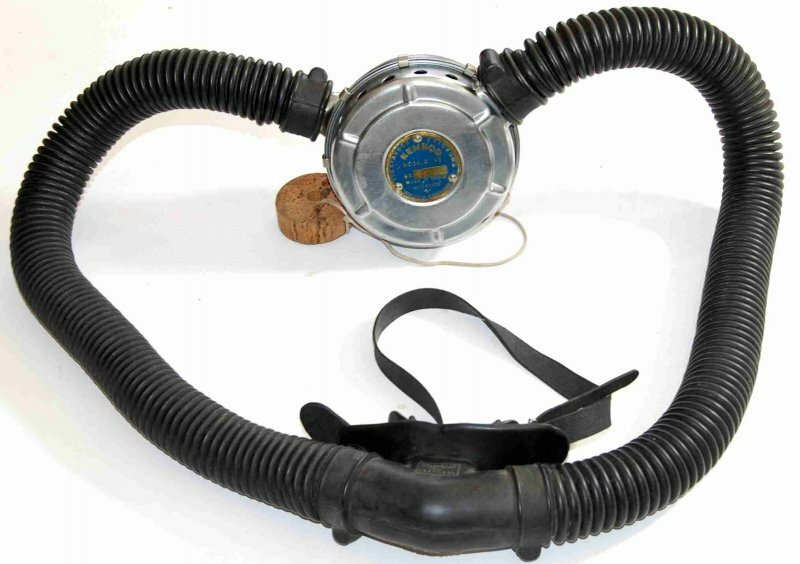 Asteria was the name of a diving mask and a snorkel made also by Nemrod. 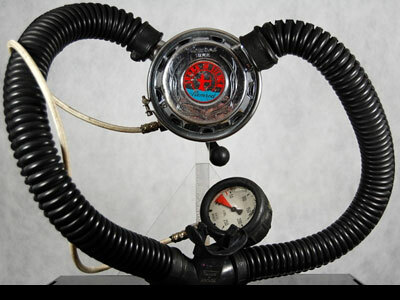 This regulator was only known as V-2 in Spain for a few years.In the rest of the world it was commercialized since from the beginning with the name of SNARK III. The brothers Vilarrubís have denominated V-2 in reference to the famous flying bombs used by the German army during World War II. This model had as exclusive features the straight nozzle and the "V-2" markings on the front plate and on the rear part. 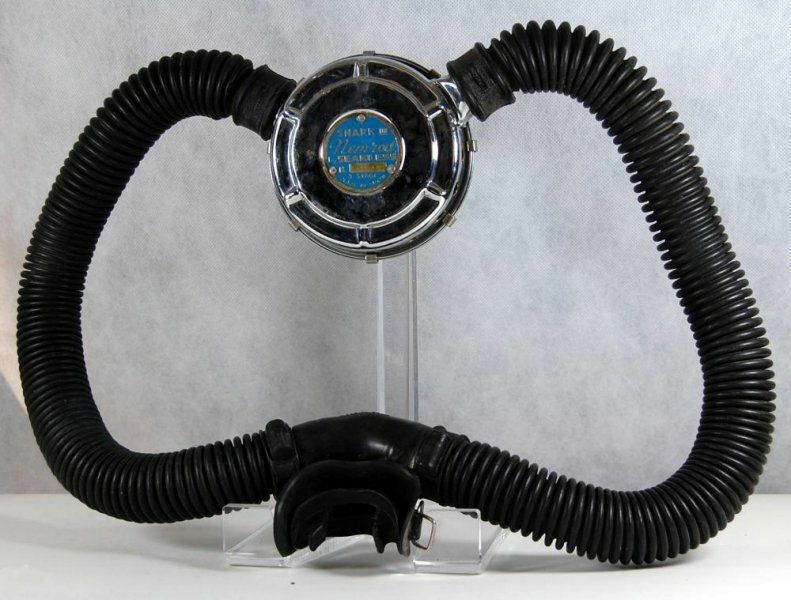 For this model is known at least two versions: With the front plate in blue (the most common) and with the sheet in black, much rarer and we thought it should be a limited series that it was made for the Navy's diving units. 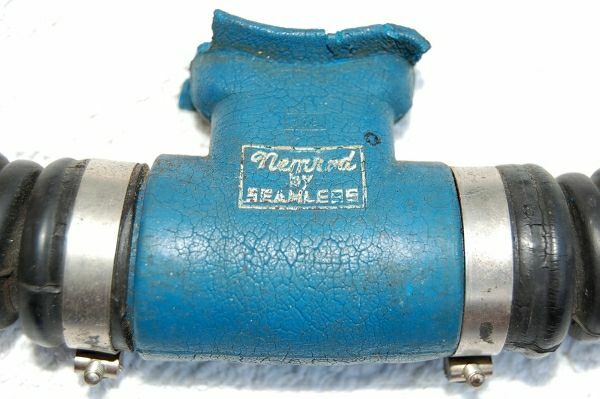 Since the mid-1950s, and in parallel with the launch of its double hose regulators, Nemrod has commercialized several types of regulators, which it has generically called "MARGUIL". These equipment had annulled the first stage, since they were connected to the surface by a hose of several meters. 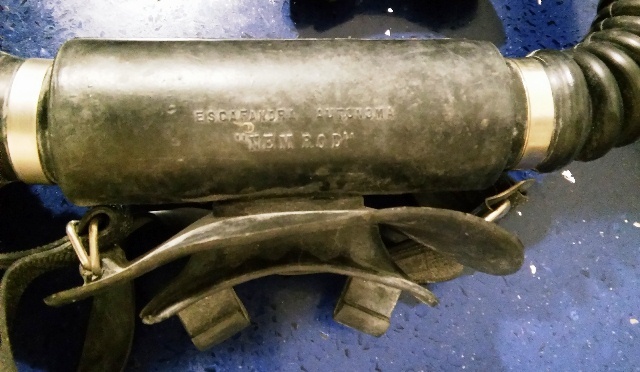 The aerial end of this hose was connected to a pressure regulator, which in turn was connected to one or more bottles of compressed air of large size or to a compressor. 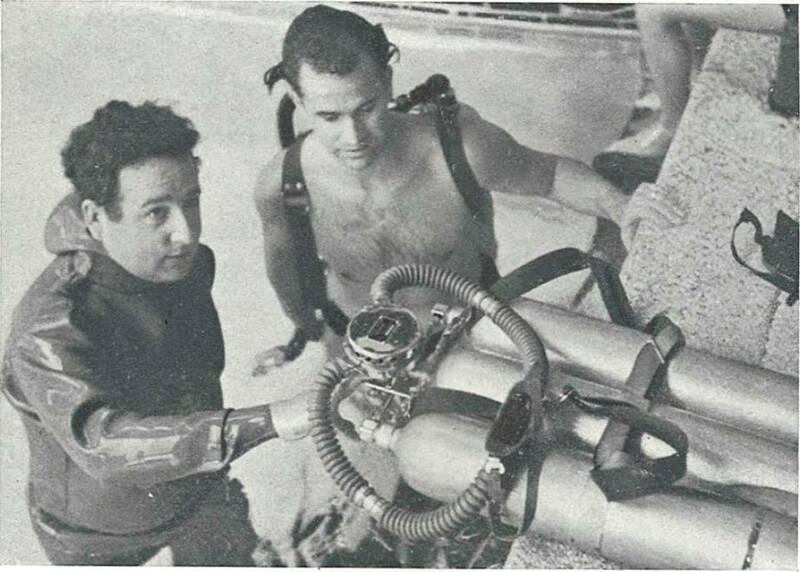 This system was mainly used for shallow underwater work, especially in port facilities, since it provided the diver with an almost unlimited air supply and allowed him to spend several hours working underwater. The equipment was attached to the body by a specific harness. 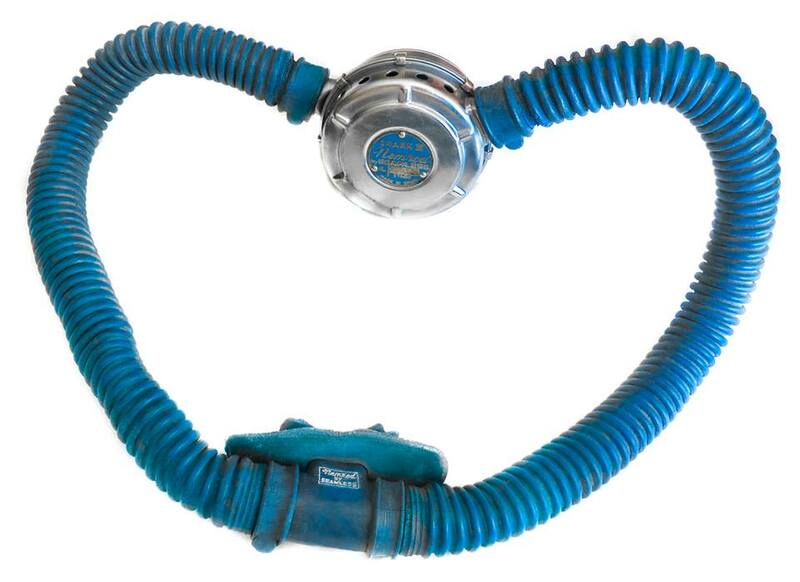 This model has marketed with blue hoses and a blue mouthpiece. 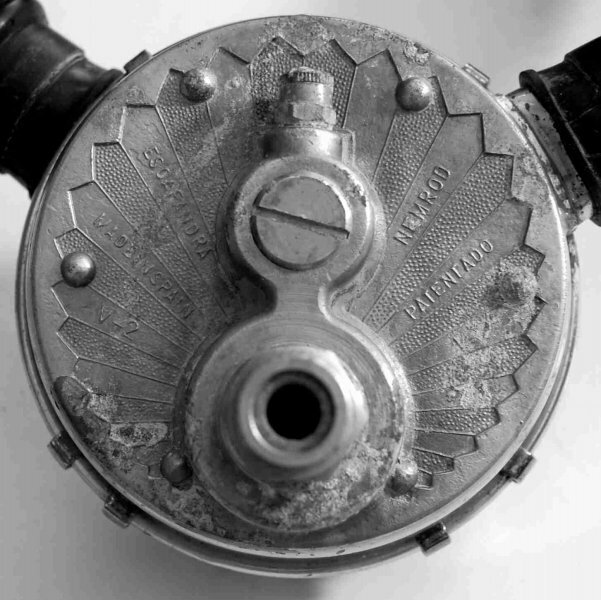 The hoses of this color, contained a component that made them degrade much more easily than those of black color and therefore, very few pieces of these have been preserved to this day. 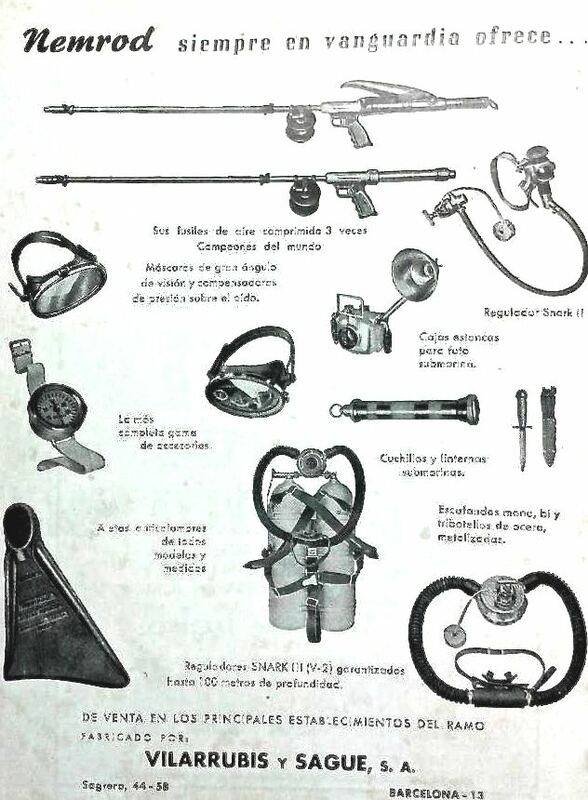 Enrique Dauner, from Spain, says that some items were also manufactured with red tracheas that degraded as fast or faster than blue ones. 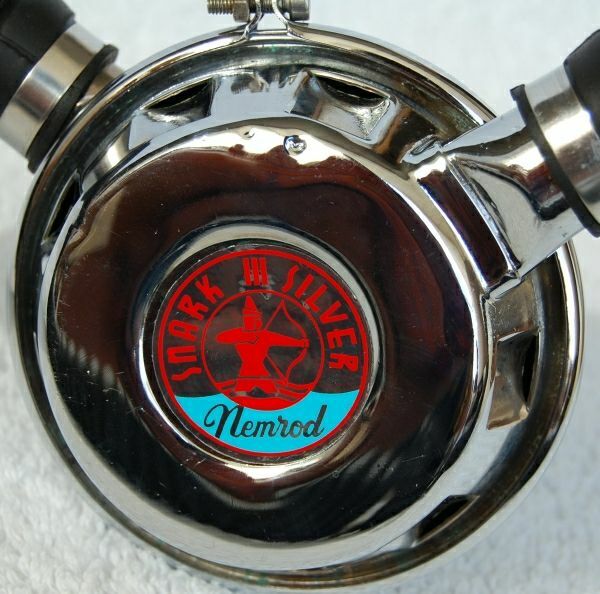 For this reason, shortly after Nemrod has opted to manufacture them exclusively in black rubber. This model has marketed with black hoses and a black straight mouthpiece. 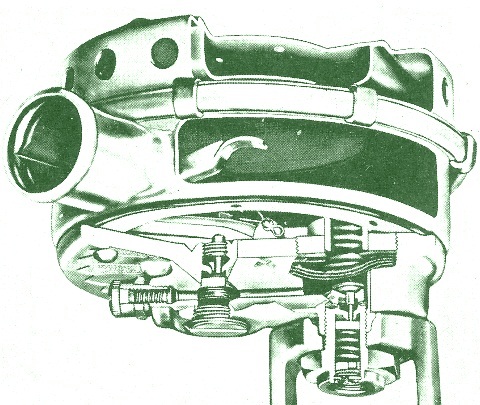 The regulator V-2 / SNARK III had minimal differences with its predecessor, the model V-2. This model had a V-shaped nozzle and although the front and the sheet were the same as those of the V-2, on the back they were marked "SNARK III". 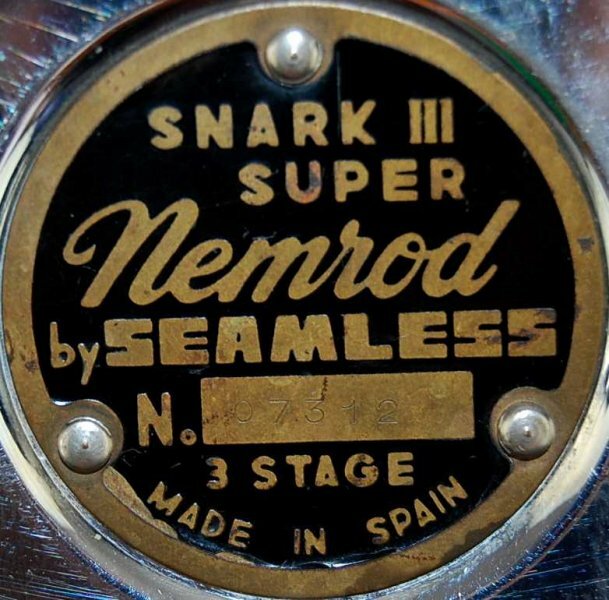 Simplicity, resistance and reliability that would end up in 1965, when the SNARK III SILVER was launched that would become the best-selling and best-known item in the world of the Spanish brand. This model was known in Spain as V-2. 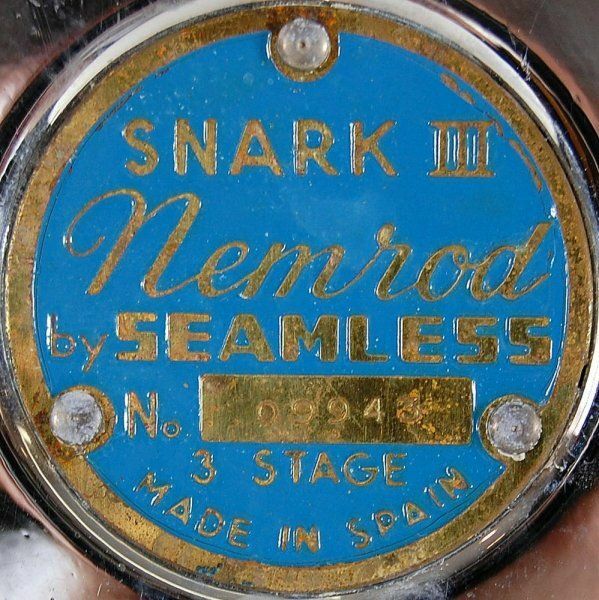 In the USA it was always marketed under the name SNARK III. 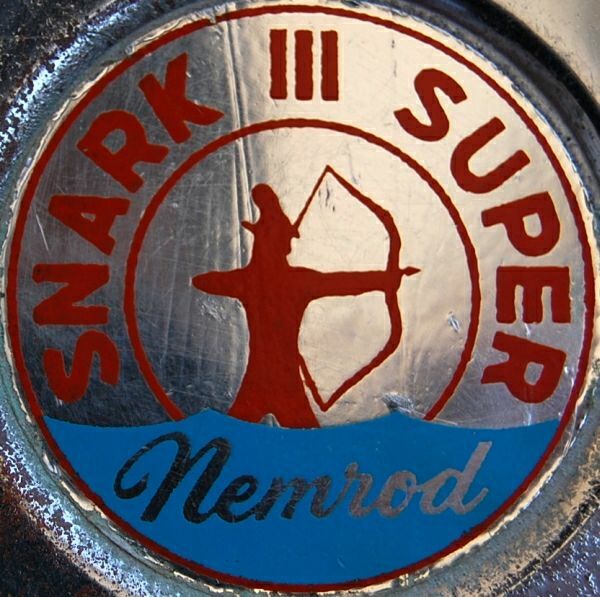 Unlike what happened in Spain, the model of Snark III "SUPER" in the USA has remained for sale for 6 years. Curiously, in the USA catalogs this model was called "DE LUXE". It did not have any difference with those that were sold in Spain except the front plate. There are two versions with different labels. 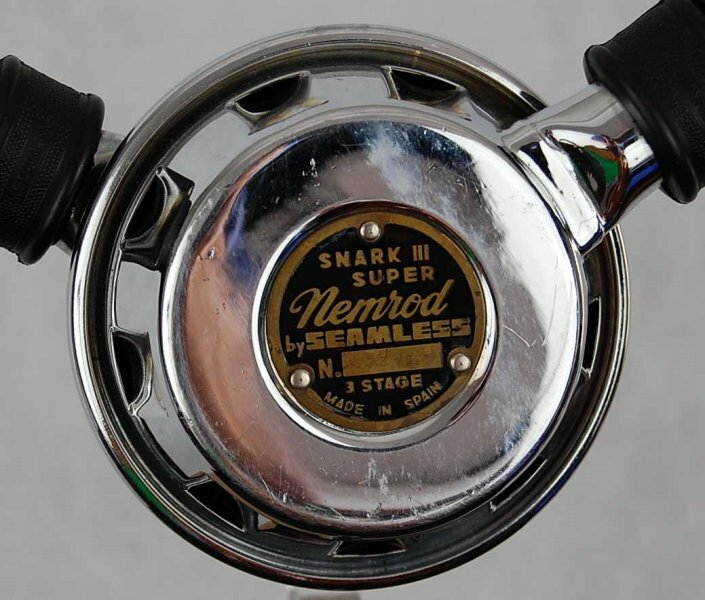 This was the model that replaced the Nemrod Snark III "Super" in the USA. 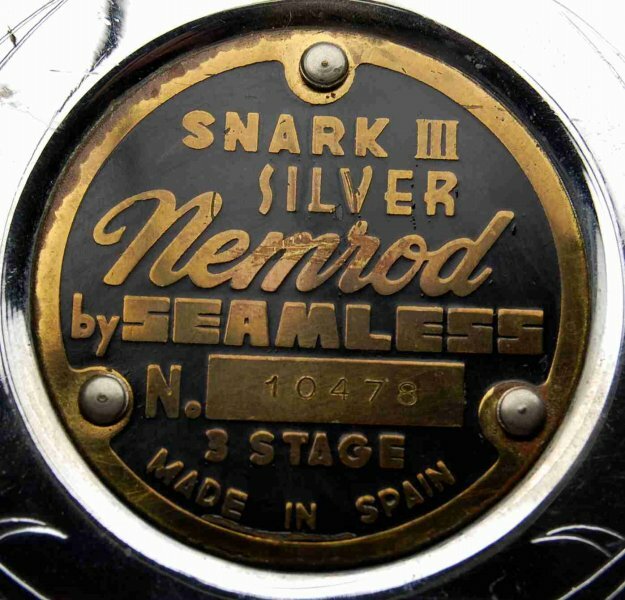 The commercialization in the USA of the model Nemrod Snark III Silver did not coincide in dates with its counterpart in Spain. Apart from the faceplate, both were identical. 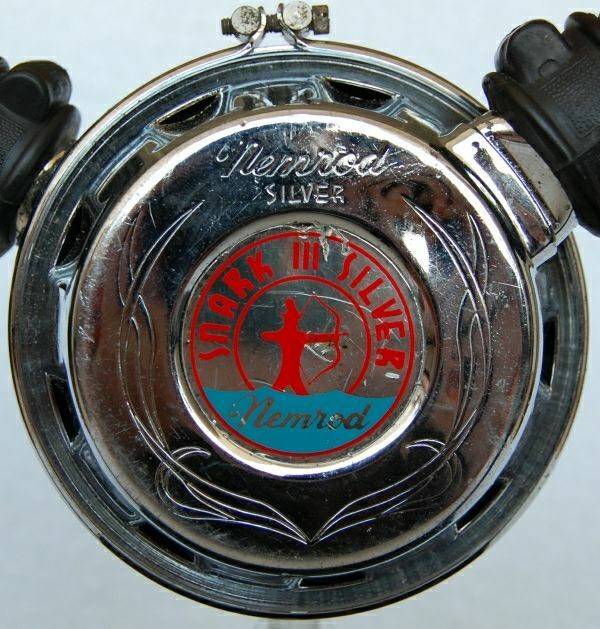 Interestingly, some Silver with the plate by Seamless were also sold in Spain. 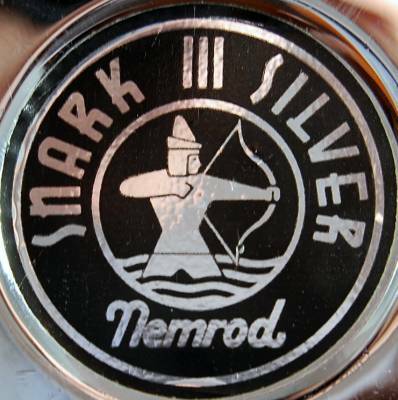 In 1966, on the occasion of the 50th Anniversary of Nemrod commemoration, the model SNARK III SILVER was launched, whose name was applied to several products of the brand. 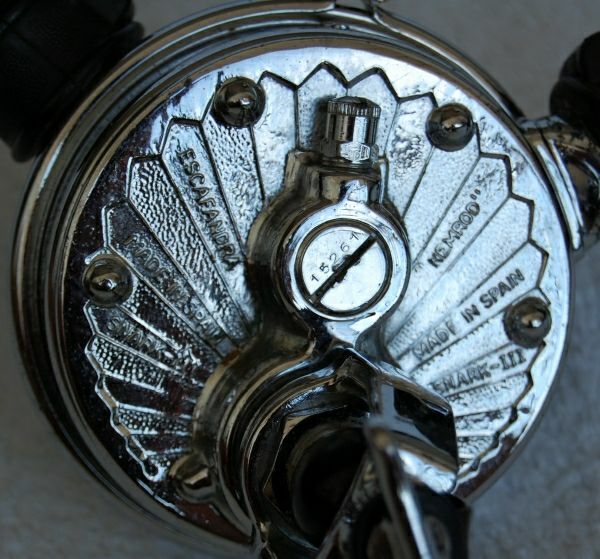 The first version of this model was the most ornate since it had engravings on the front and the back of the box. 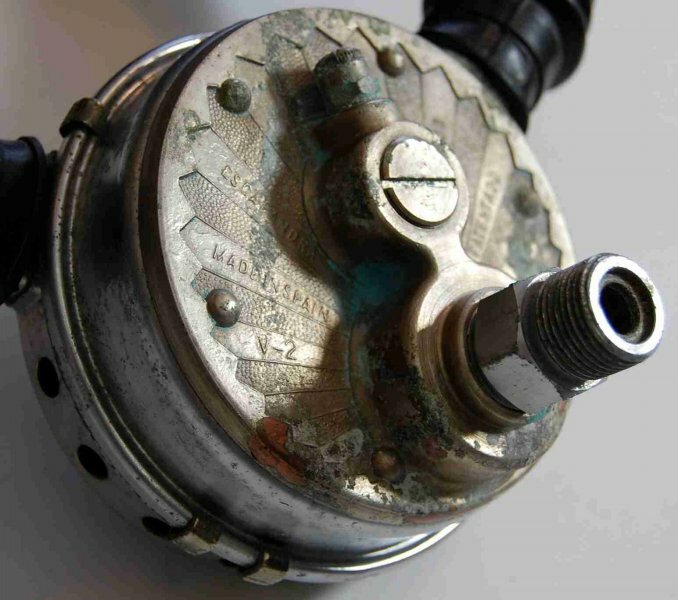 In 1970, a high pressure outlet to connect a submersible manometer (type 1b) is added to this model. So, the Version 1 type 1a does not have HP port. 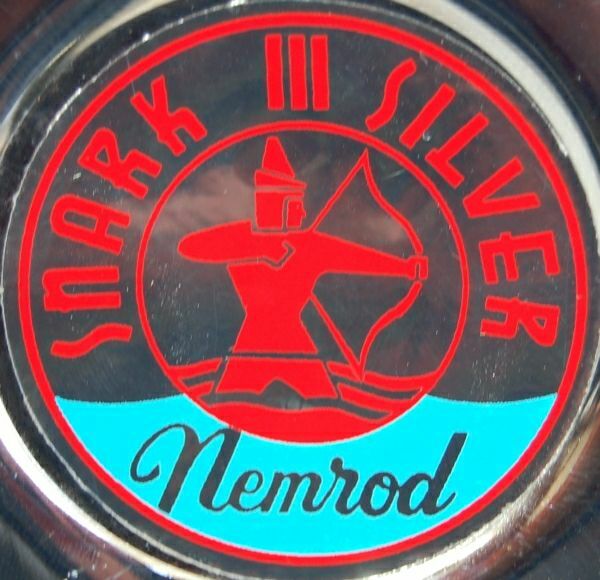 The Nemrod regulator model SNARK III SILVER Version 2 had two variants that differed from each other type by the sticker. 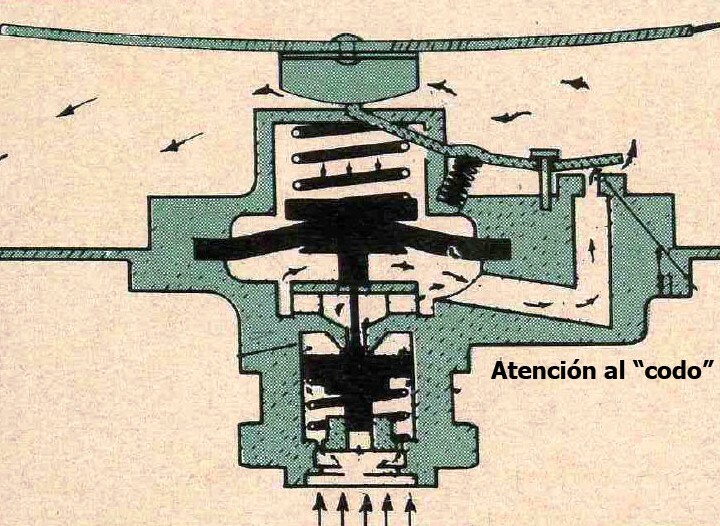 In the type 2a the archer's drawing is more schematic and does not have the red wavy lines that appear in type 2b. - The plate is also clearly different from previous version. - The characteristic "ray" decoration disappears and all come with the high pressure outlet. 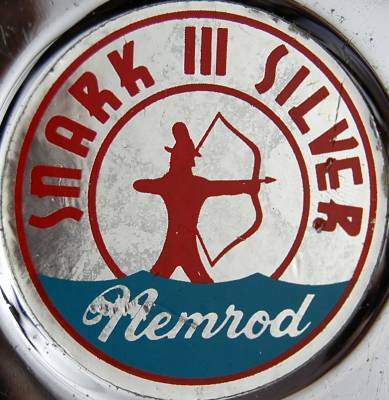 The last version of the Nemrod SNARK III SILVER, with its characteristic black sticker, was the one that stayed longer in the market. 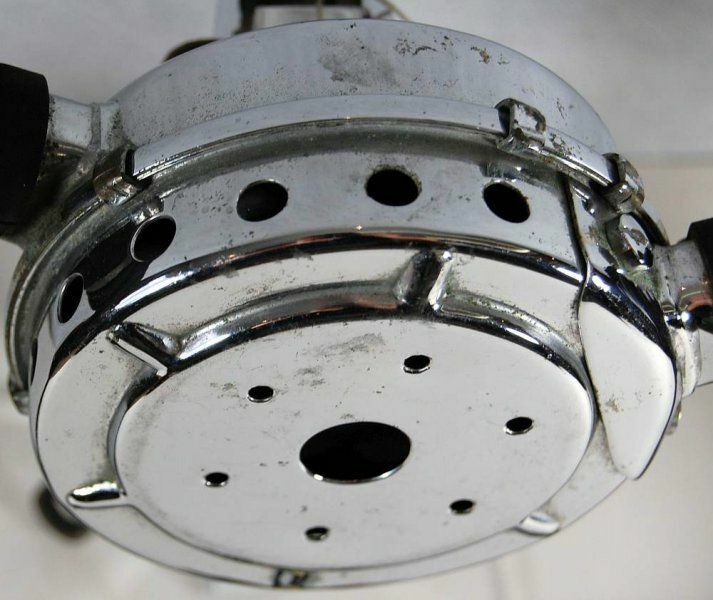 - Type 3a: With 1 high pressure outlet. 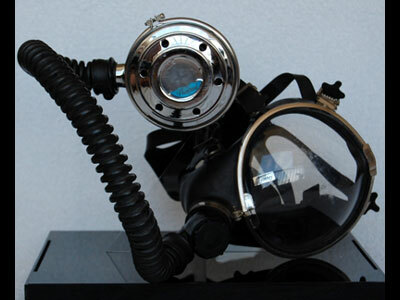 - Type 3b: With 1 high pressure output and one low output (from 1989). 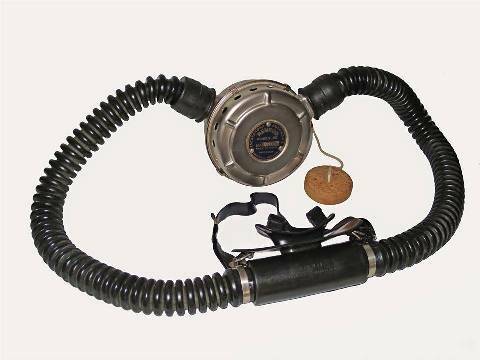 - Type 3c: With 1 high output, 1 low output port and silicone hoses (mid 90's). 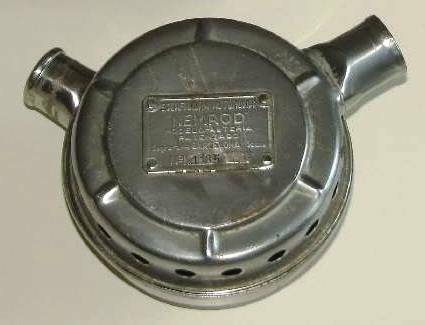 Before the development of the single-hose regulator both, first and second stages were located in the housing. 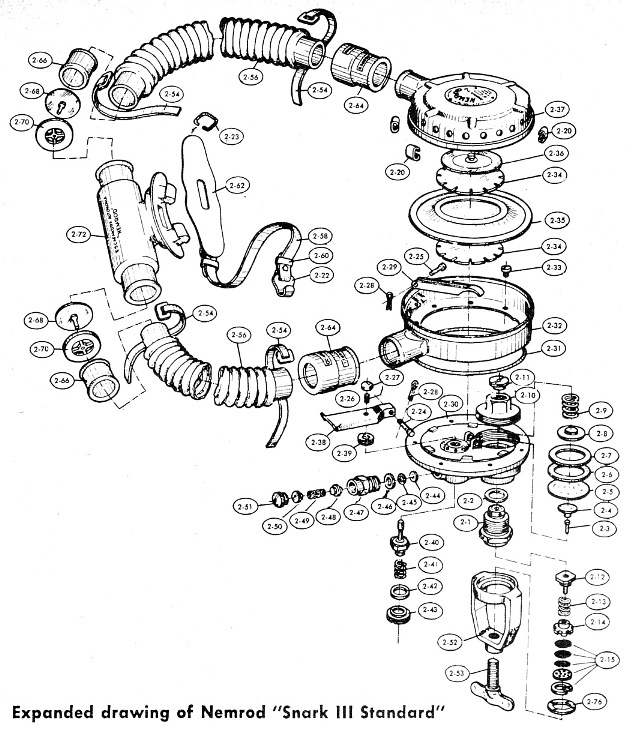 The first stage offers the same generic function as all un-balanced diaphragm regulators. The h.p. diaphragm holds the upstream h.p. seat in the open position while at rest. High pressure air enters the h.p. chamber and flows past the h.p. seat and through the h.p. orifice, (or the volcano, as it's often called) and into the intermediate pressure chamber. 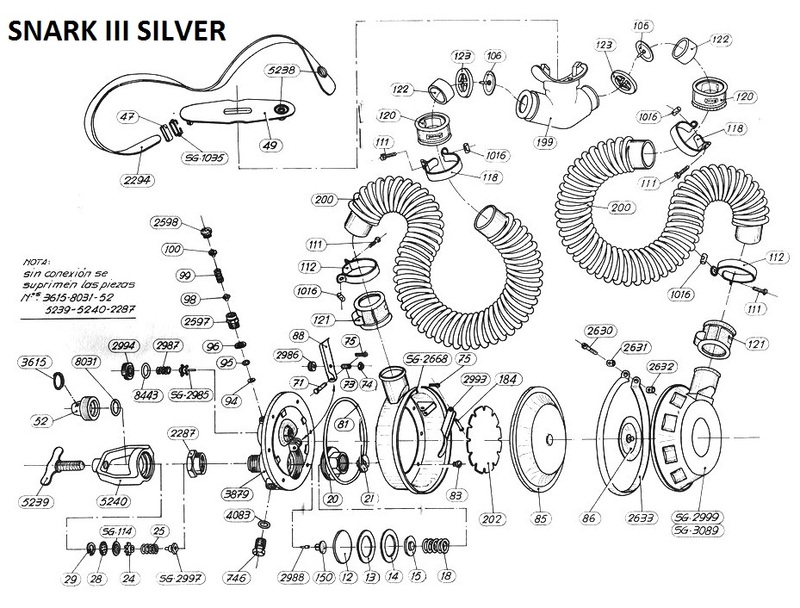 The pressure builds against the upstream low pressure seat until reaching a set pressure of 140 psi where it overrides the main-spring pressure and collapses the diaphragm, causing the h.p. seat to seal against the orifice and stop airflow. 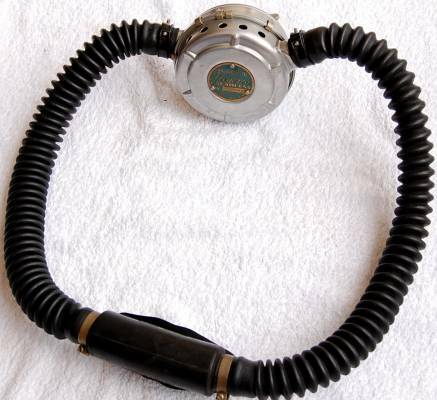 As the diver inhales, the large, low pressure diaphragm collapses an the lever assembly. This pushes the up-stream I.p. 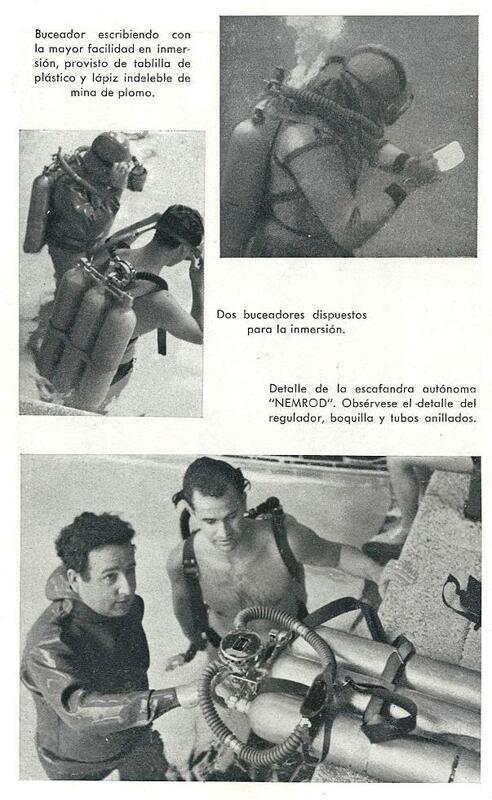 seat up and away from the seating surface and allows the air flow to the diver. 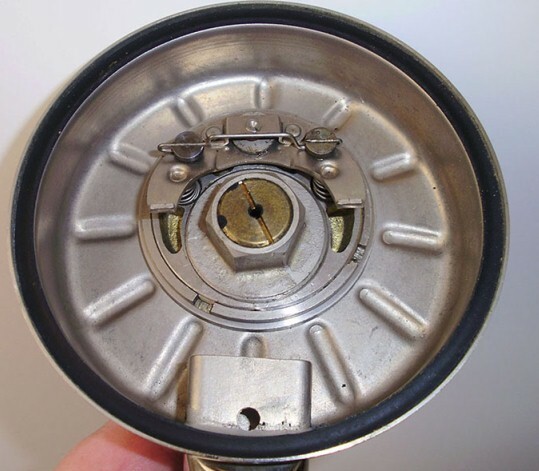 As the air pressure in the intermediate chamber drops, the main spring pushes against the h.p. 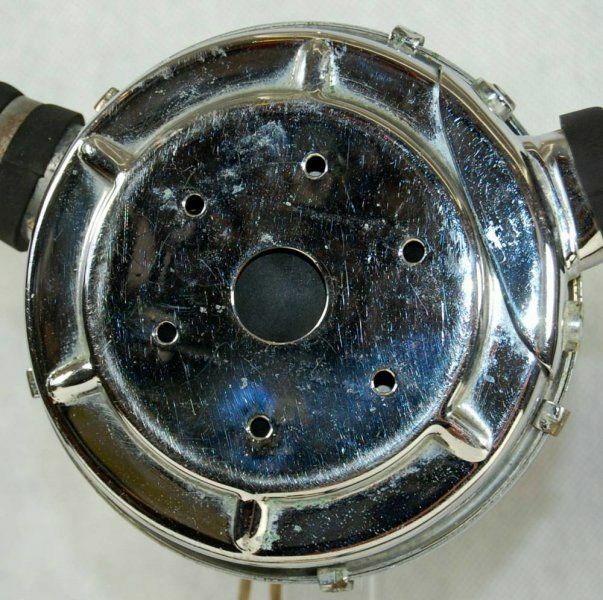 diaphragm which raises the h.p. seat and full air flow is now established. 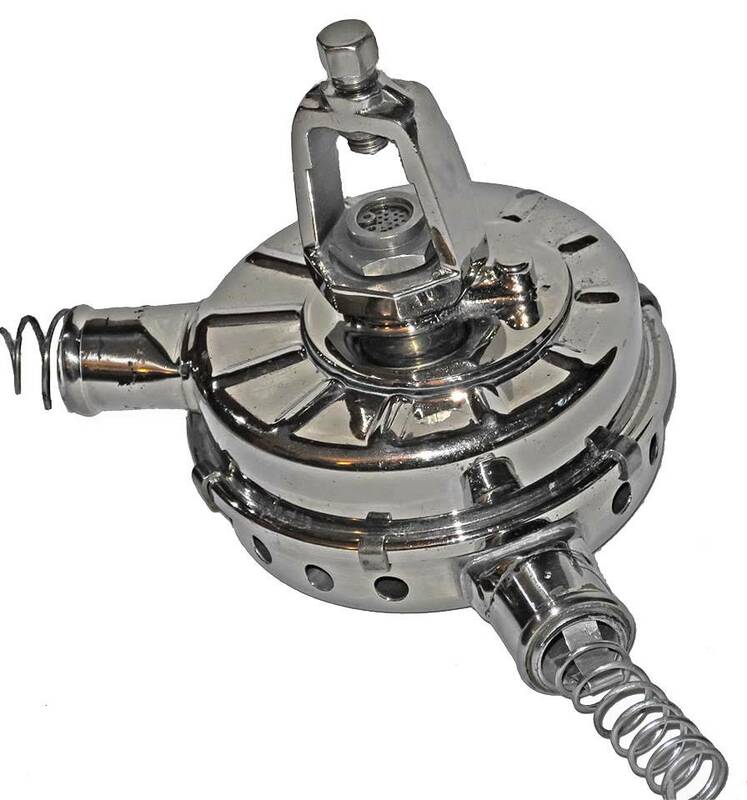 On any upstream second stage regulator it is imperative to have a pressure release valve. This allows the second stage to remain operational in the event of a catastrophic h.p. seat failure which would have the tendency to press shut the seat with the increasing air pressure. On the Snark III the over pressure relief valve is found an the back, just above the yoke assembly and is set to free-flow at a pressure of 210 psi. 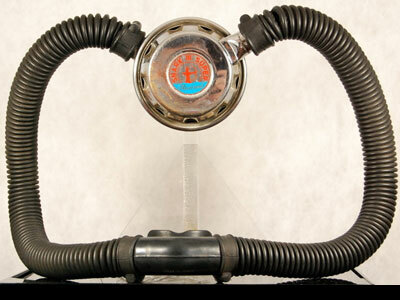 The double hose regulator Snark III by Seamless (USA) and the Snark III Super by Seamless (USA) is from the 1960s. 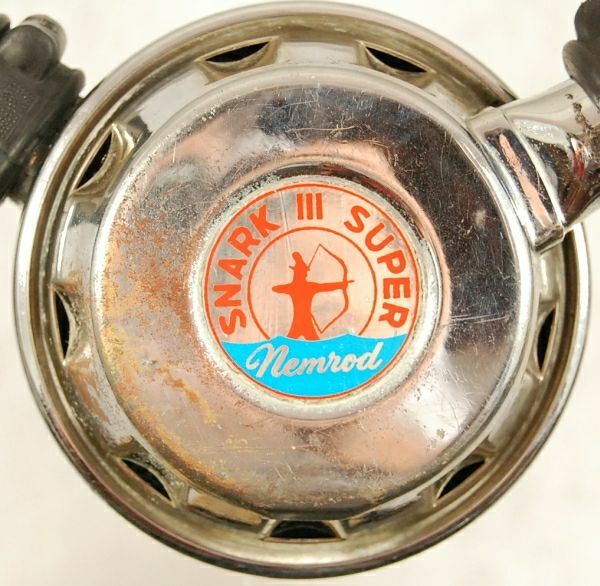 Nemrod changed the regulator in the 1970s and re-named it the Snark III Silver by Seamless (USA), but internally it remained the same regulator. 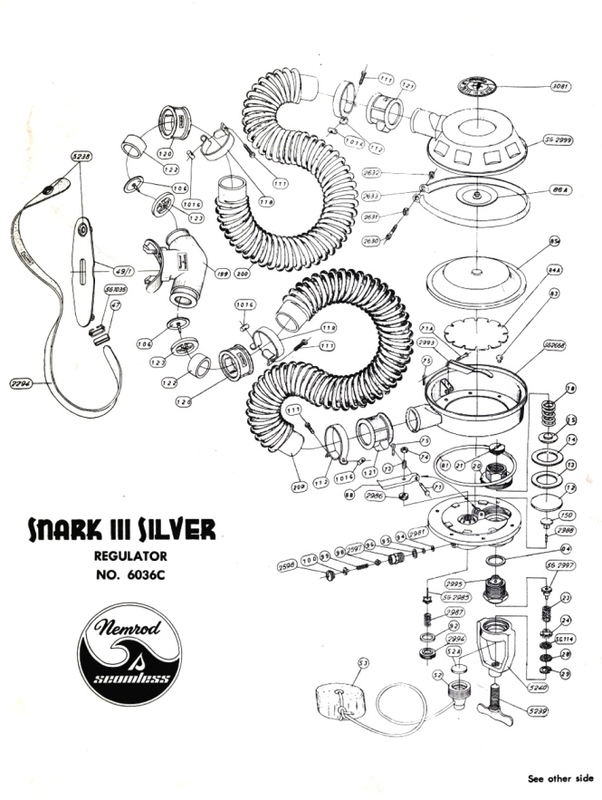 The biggest difference between the Snark III by Seamless (USA) and the Snark III Silver by Seamless (USA) is a LP port in the Snark III Silver. 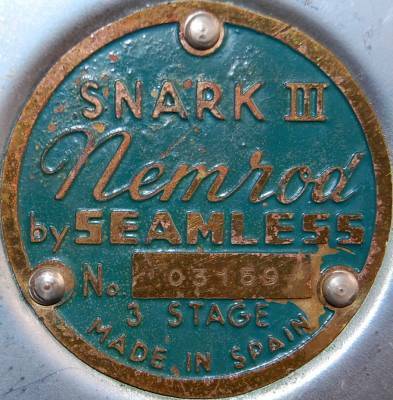 Nemrod advertised Snark III by Seamless (USA) and the Snark III Super (Black Label Metal Rivetted) by Seamless (USA) as a "3-stage regulator," but the "third stage" was that overpressure relief valve you could see at the top. 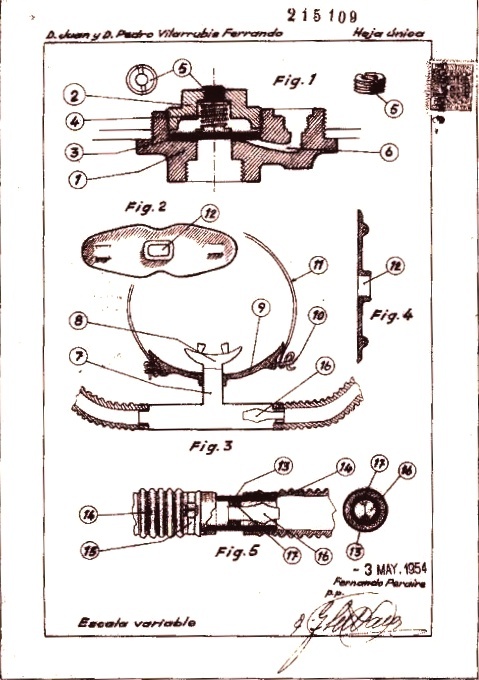 The first stage is a standard spring-biased diaphragm stage (unbalanced), and the second stage is basically designed like Mistral, even having compound levers for the demand stage. 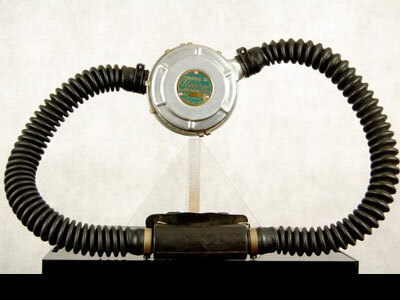 The LP diaphragm is a nice and flexible. The exhaust mushroom valve is also robust. 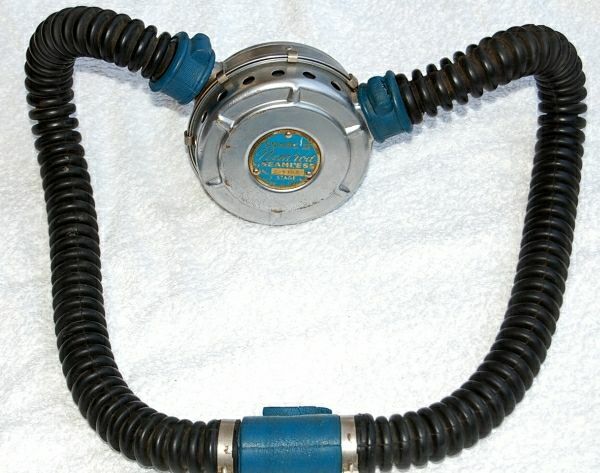 The one disadvantage of the SNARK III regulators have is that with the very low attachment to the valve, the regulator rides about two inches higher on the tank than other double hose regulators, so adjustments in the harness need to be made to lower it between the shoulder blades or the breathing may be a bit harder. 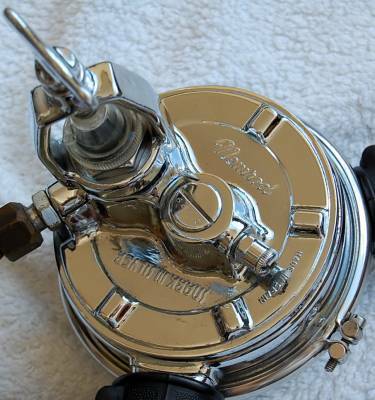 This is due entirely to the valve positioning, and not the mechanism itself.